If there one thing we absolutely love about Living Hope Church is the fact that although we are small in numbers we are a body of believers from all around the globe and when we gather to worship King Jesus it is a foretaste of heaven. Currently, we are going through a series on what it means to be a member of the local church and last Sunday Donovan reminded us that when the church is deeply united, God is glorified. Testimony is given that something supernatural has happened and that the gospel is real. The gospel IS real and so we are blessed to host Living Hope’s communion service every other month in our home. 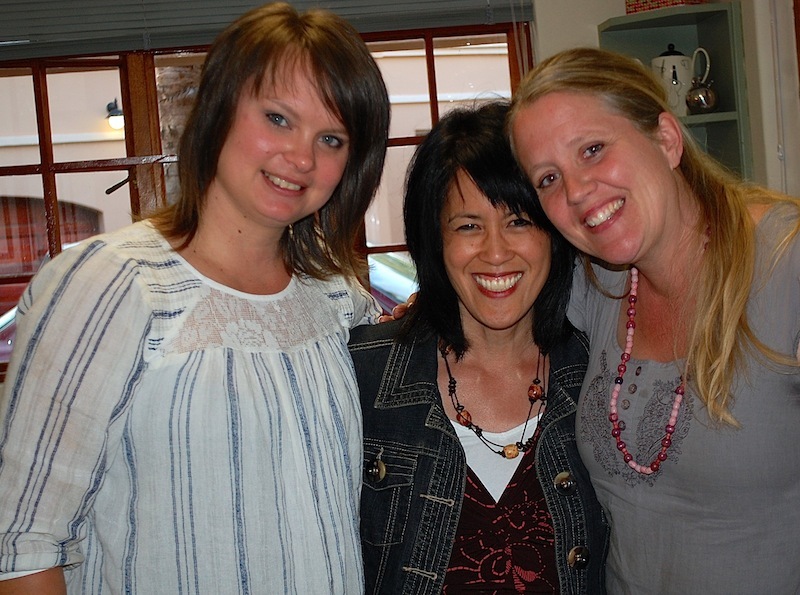 Ladies Ministry: Year two of Ladies Ministry is in full swing. We gathered together on a Saturday in January for our year kick-off with a “Women on a Mission” conference together and have now resumed our study of the book of Galatians. We are learning over and over from the Apostle Paul the amazing truth that the gospel is real and that our righteous standing before God is not a result of performing goods works for God, but is a result of faith alone in what Christ has done on our behalf. 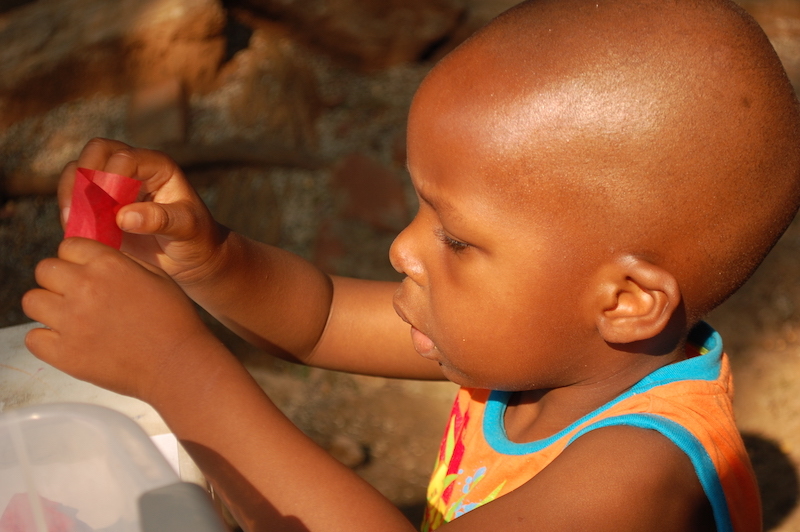 Project Timothy: One of the ongoing ministries of 1Hope is Project Timothy. 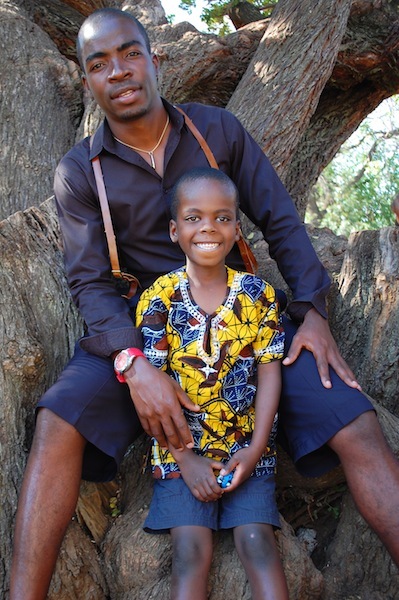 From the website: Project Timothy is a focused, comprehensive, church-centered program that seeks to mentor godly men from Africa for biblically faithful, effective pastoral ministry, so that more healthy churches are planted and existing churches are strengthened, for the saving of the lost, the maturing of believers, and the glory of God. Two men are currently being supported through Project Timothy, Nixson , who recently graduated from seminary and is training to be an elder at Living Hope and Antony from Malawi who currently in year two as a student at Christ Seminary. Also pictured is Micha, a young man from Germany who has come to intern with Living Hope and 1Hope. 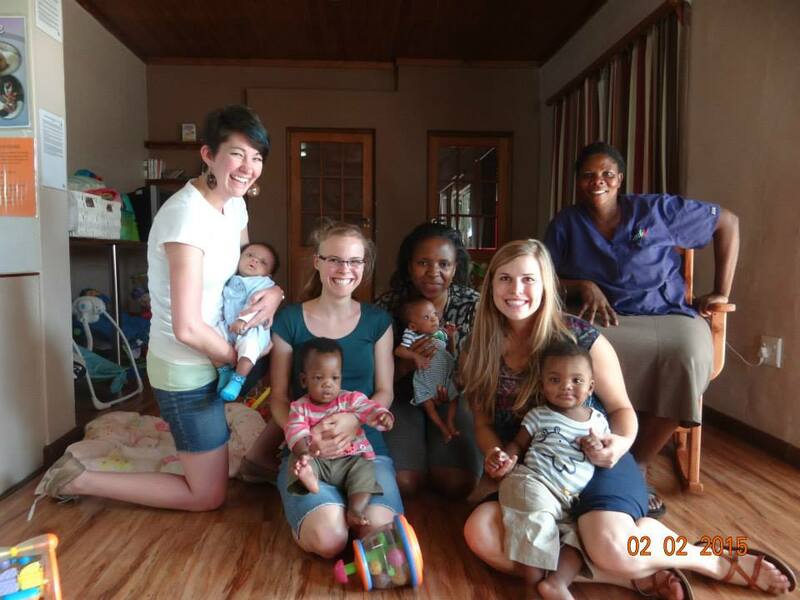 The Muphamuzi Baby Home has welcomed two new members to its staff: Sarah Ray from Little Rock, Arkansas has joined the 1Hope team as Director of Interns for the MBH. She has committed to two years and has jumped right in to ministry life. Emily Kirk has joined us as a Baby Home intern for the next few months. Emily always has a baby in arms! 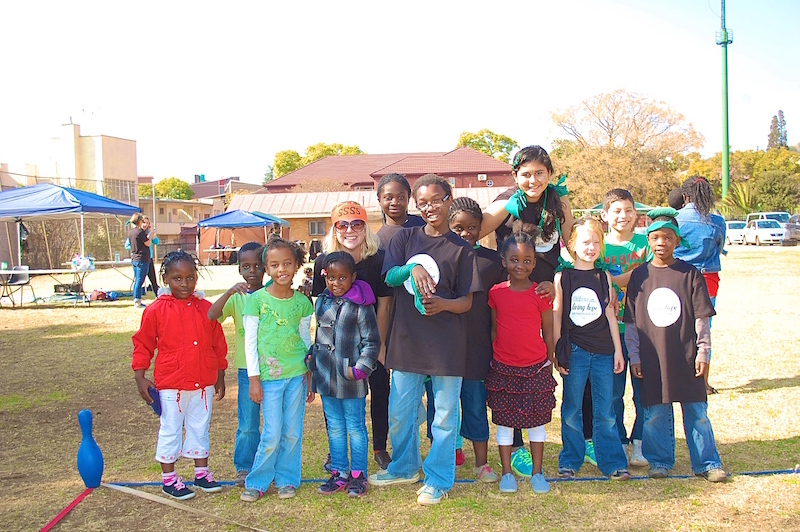 1Hope Fun Day– As the ministry team grows, we must be intentional to spend time fellowship and growing together. In order to facilitate this, Andre and Karlien put on a Master Chef competition for the members of 1Hope. It was great fun and Handy Randy was on the winning team! A Lucky Story One Sunday before church, Randy was on his way to the hardware store to pick up cement and other supplies for a building project. Usually, there are several men hanging around the outside of the store hoping to get hired for the day, but this Sunday morning there was only one man holding up his arm in attempts to catch the attention of those driving by. Randy found the man still there after leaving the store. It was a Sunday and we really had no work for him, but Randy figured he could be of help by unloading the bags of cement for us, and so picked him up. Lucky (the man’s name) worked hard that hot summer morning unloading the heavy bags and when it was time to get ready for church, Randy intended to drop him back off where he found him. Before he sent him on his way, Randy handed Lucky a booklet that Pastor Josh has written entitled, “The Best Story Ever”. This little book carefully and Biblically details God’s redemption of man through the glorious gospel. Lucky’s response surprised Randy when he said, “Oh, I have that book.” (And since only a few hundred of the books are in print, my first very skeptical, suspicious response when Randy told me was, “No, he doesn’t. He’s making that up.”) Lucky went on to tell Randy that “some white guy handed it to him” while he was selling things at the stoplight and showed Randy the chapter he was on. Randy then asked him if he would like to come to church because the author of the book is our pastor. Lucky did come to church with us that Sunday, but afterwards we did not hear back from him despite Randy’s attempts to get in contact with him. Two Sundays later, however, at 9am, Lucky showed up at our gate wanting to go to church. After asking around, we discovered that Micha, the German intern, hands out the booklets to the people begging or selling items at the stoplights. Lucky was in need of work and a place to stay, but more importantly he was in need of the Savior. We have been privileged to be placed in Lucky’s life for now to help him with his physical needs, but more blessed to be able to share the love of Christ with him. In the month that we have known this young man, he has proven himself to be a very diligent, consistent worker and he has made efforts to come to church although he now lives very far away. We pray that God may open the eyes of his heart that he may see that the gospel is real and come to a genuine saving faith in our Lord and Savior Jesus Christ. Lucky’s story reminds me that our Sovereign God is a God who is near. He sees and cares for all. From the sparrow that falls to ground to a hungry man looking for work standing outside a hardware store – not one is outside our Father’s care. Since South Africa was voted most beautiful country in the world, we figured we may as well experience it while we are here! Back in January we were thankful to get away a bit and enjoy some family time together hiking, biking and horseback riding in the magnificent beauty of this country. Joy and Blessings to you from the Clark Family! Due to the global weather phenomenon, “El Niño,” which periodically occurs due to the warming of ocean temperatures, South Africa is currently in the grip of a severe drought. As a result it has been the hottest, stickiest, driest summer we have experienced so far. But this did not prevent a very sudden and extreme hailstorm to hit our neighborhood a few weeks ago, which caused our kids to run out and pretend it was snow. Unfortunately this resulted in quite a bit of damage to our newly planted flower garden but thankfully, our roses are rallying. In a matter of minutes, our lawn and garden was covered in white. In everything give thanks (1 Cor 5:18). In November, in honor of our beloved American holiday, the grocery stores in Pretoria stocks frozen turkeys. The largest turkeys I was able to get my hands on was a whopping 4.24 kg (9.35 lbs) and only took 1 ½ hours to cook! We needed three of these birds to feed our Thanksgiving party. 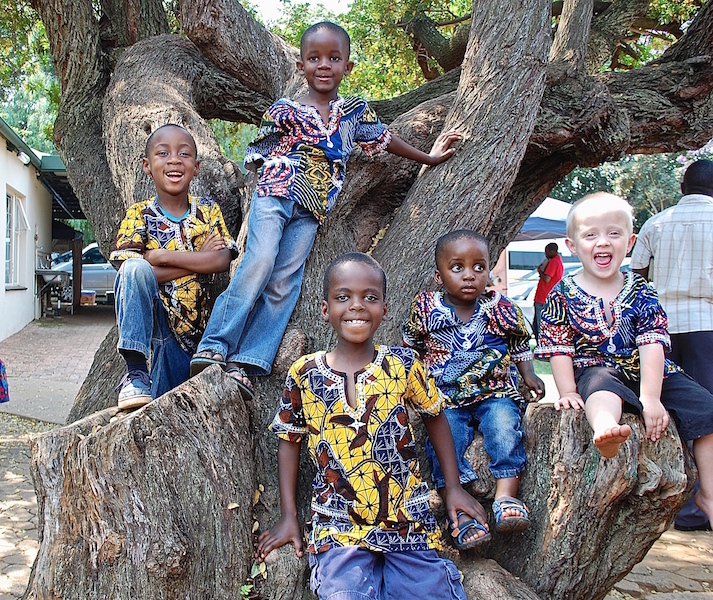 Mission Malawi Update We are thrilled to report that the Chilingulos have returned to Malawi. 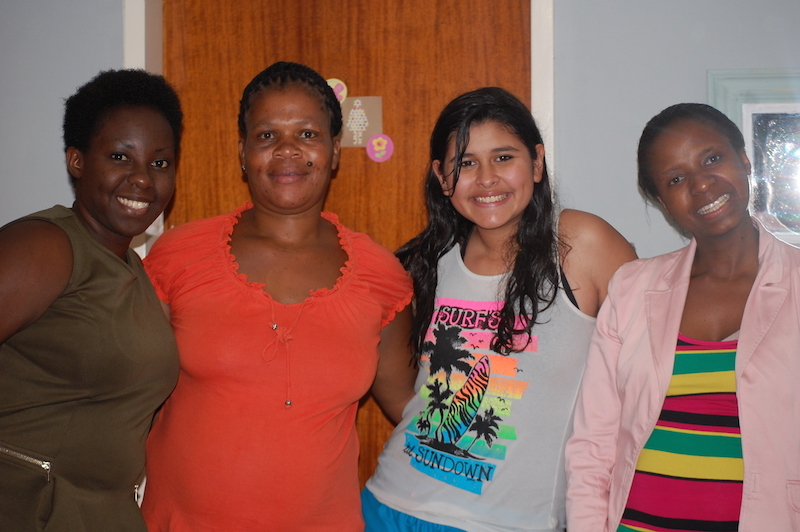 All of Chisomo’s necessary paperwork, after three months of waiting, has come through. 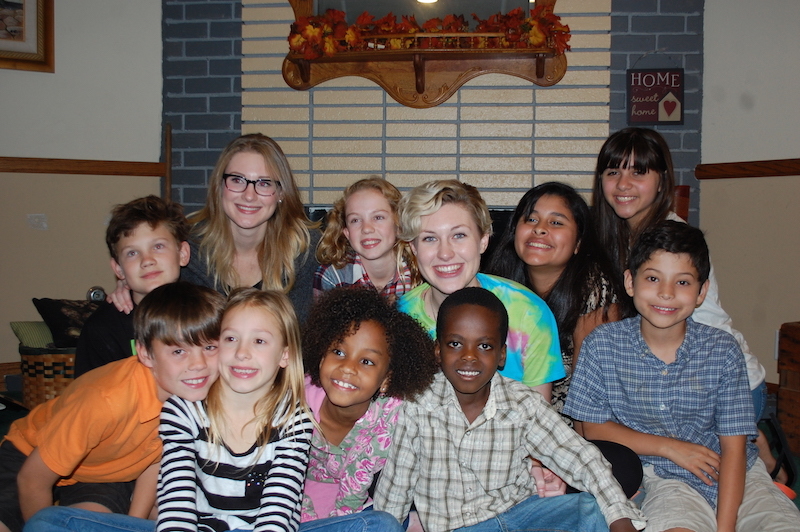 We were grateful to have them celebrate Thanksgiving with us and so enjoyed having them stay with us awhile. But as much as we will miss them, they were overjoyed to return home to the life and ministry that God has called them to in Lilongwe, Malawi. 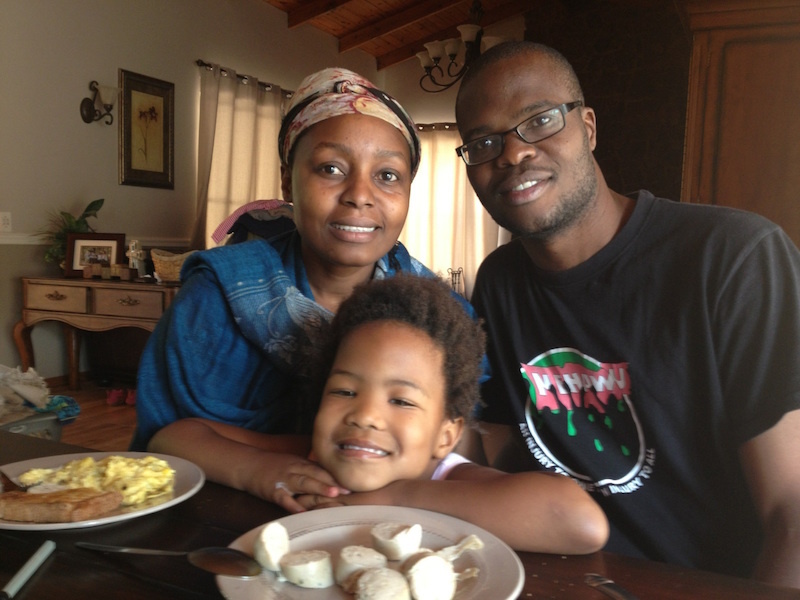 Mission Malawi-The Chilingulos are back in Malawi together! 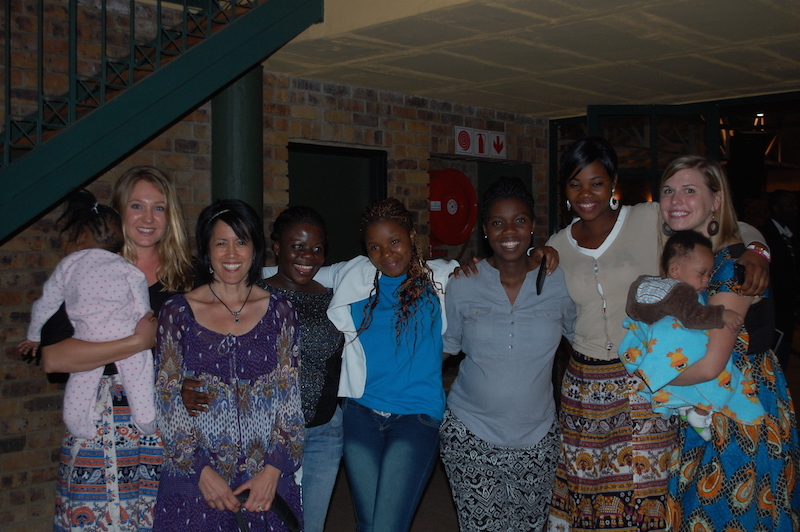 Just before they left, we had one last celebration with them at our Thanksgiving dinner. Very appropriate as there was much to give thanks for! Living Hope Church Children’s Ministry One year ago, if you were to visit Living Hope Church during the sermon time, you would have seen mothers sitting out on the lawn with their babies or chasing their young toddlers through the service at the same time trying to catch a few words from the sermon through a speaker that was set up on the outside of the church. 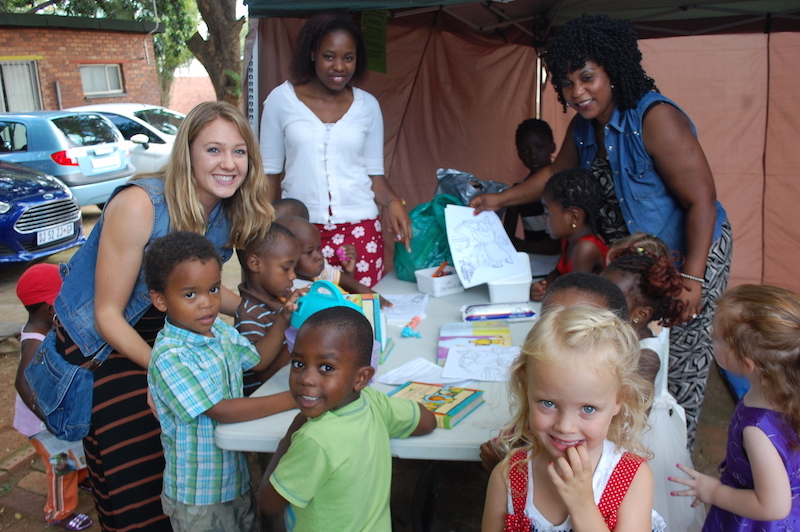 But due to the ministry of the ladies (in the photo below) and the commitment of men coming early to help set up the tents and tables LHC had a nursery for the babies and Children’s Church for preschoolers this year. 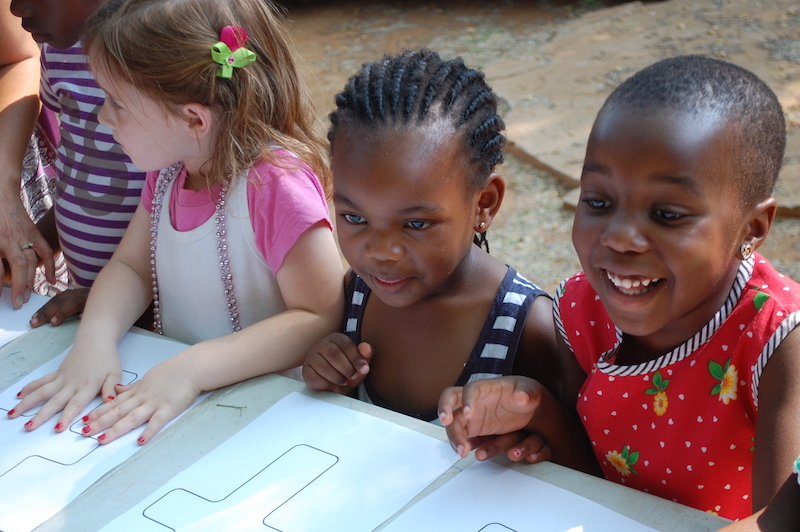 Our preschoolers learned the books of the Bible, questions and answers from a Children’s Catechism and memory verses. We pray that one day God will provide a church building for Living Hope and Sunday school can be held for all the children, but until then, we are excited for another year of children’s ministry Living Hope Church style. The teachers and helpers of this year’s children’s ministry gathered for a meeting and teacher appreciation celebration. Thankful for their ministry. Amen. 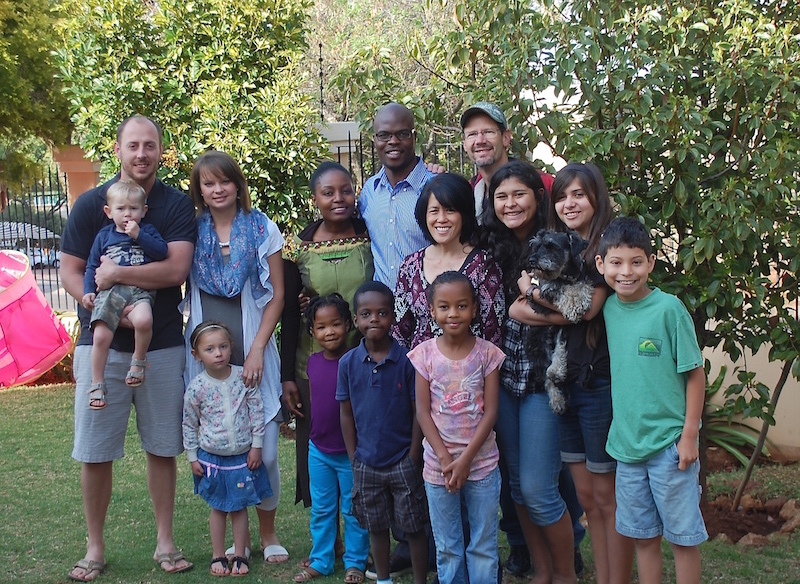 We are privileged to stand alongside Nick and his family as they seek to further the gospel throughout the continent of Africa. Nick and Esther with their children and his graduation cake! Family News Marissa and Sophia both celebrated birthdays this spring (American fall). Sophia is 10 years old and with Marissa turning 13, we now have two teens in our family. Family Additions The Muphamuzi Baby Home will be closed for the holidays in order to give the caregivers rest and time with their families. We have the privilege of caring for this sweet baby boy (only for 1 ½ weeks). He is one of the newest little ones at the Baby Home and is just over a month old. Precious Eternal Soul. Sweet Little “Toby” will be with our family for a week and a half. 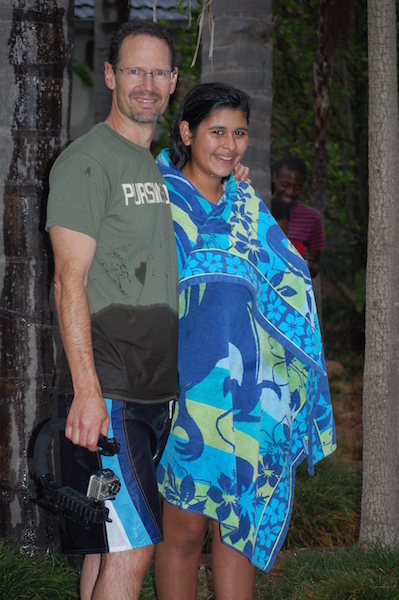 20 year-old Balekane is a student at a local private art college, who last June at the prompting of a friend, found herself compelled to listen to sermons by Paul Washer. She listened to the same sermons over and over until she became aware of the truth that, contrary to what she previous believed, she was not “good”, but a sinful person in need of redemption and reconciliation to God. In her searching she learned the truth: that this has already been graciously, mercifully, and lovingly accomplished by the finished work of Christ on the cross. She also began reading her Bible and in a short amount of time read through the entire New Testament. She continued to listen to sermons online, but also began searching and praying for a church. Through a series of God-ordained events and to our delight, she found herself at Living Hope Church. Bale lives with her parents only a few minutes from us and we have officially “adopted” her as the sixth child and oldest sister. 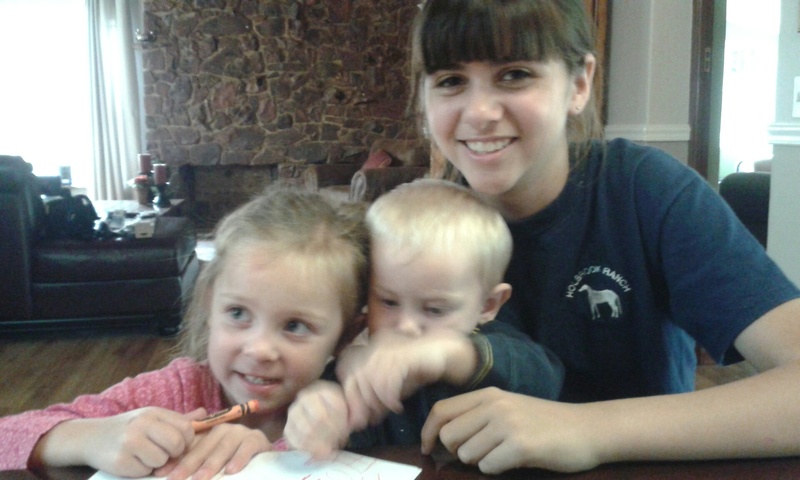 She joins us at least one evening a week and shares her amazing artistic talents with our kids. Merry Christmas and Happy New Year from the Clarks. We pray that now and in the new year you may experience a deeper sense of God’s eternal goodness and glorious grace and boundless blessing as you Behold the Lamb. “Behold the Lamb of God, who takes away our sin. Behold the Lamb of God, the life and light of men. Behold the Lamb of God, who died and rose again. 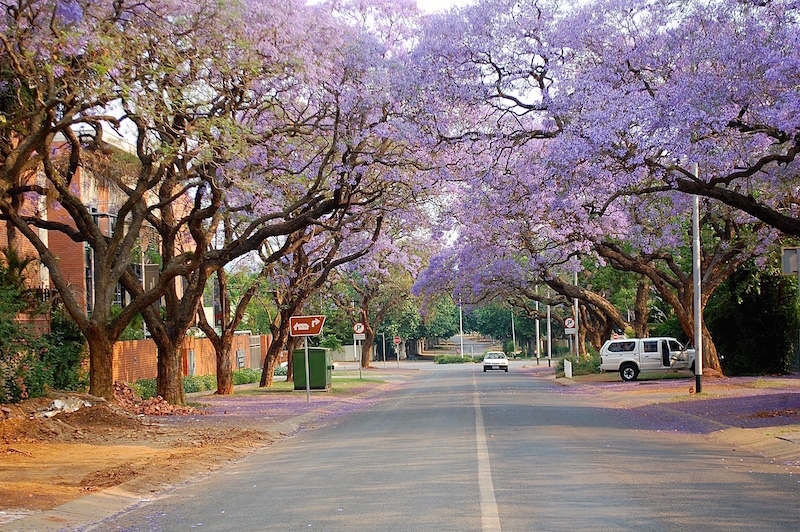 The Jacaranda City October in Pretoria is marked by clouds of purple on every major street as the estimated 70,000 jacaranda trees begin their yearly bloom. These trees are not indigenous to South Africa and the first two trees were imported from Brazil in 1888 and planted at what is now Sunnyside Primary School (Where we held AWANA for two years). 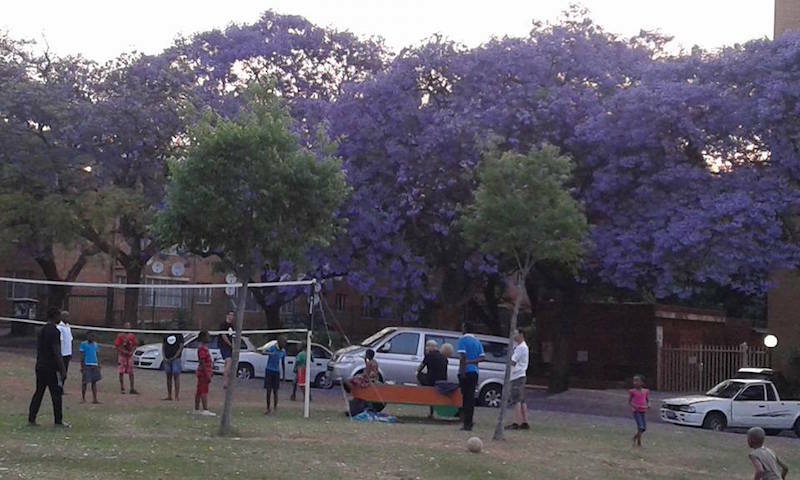 The trees did so well in Pretoria that the government commissioned a horticulturist to line every major street with jacarandas. Ironically, these trees are now considered an invasive plant and it is no longer legally to plant new ones. The city is stunning purple profusion and we are in awe of it and the paintbrush of our Creator when our daily activities require us to drive around the city. One of many purple roads on our way home from church. Muphamuzi Baby Home Reunion: Simon (AKA Sipho) and Chisomo (AKA Aya) See the next photo of when they were both in the baby home waiting for God to place them with their forever families. 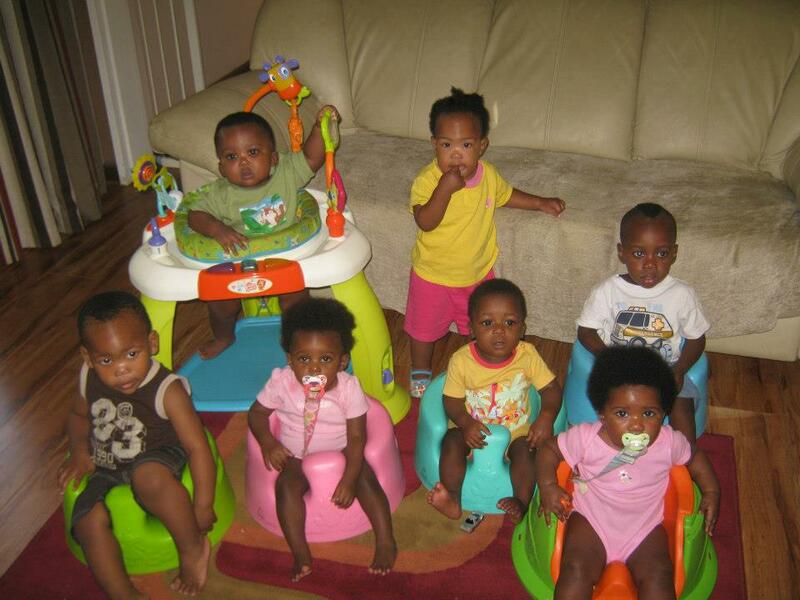 Can you figure out which babies are Simon and Chisomo? They are the two babies in the back row. Also, pray for the church plant that is still very much in its seedling stages. Over the past seven months the church has grown from a handful of committed attenders to 20-30 strong. Within this small church body, as in much of Africa, many would profess to be Christians, but do not seem to have a true understanding of the gospel. Newton’s work is to provide Biblically sound teaching for these young believers so that “Christ may dwell in their hearts through faith… and that they, being rooted and established in love,may have power, together with all the Lord’s holy people, to grasp how wide and long and high and deep is the love of Christ, and to know this love that surpasses knowledge—that they may be filled to the measure of all the fullness of God. (Ephesians 3:17-19) Vanessa is reaching out to the seven women that consistently attend to disciple them and grow them in the knowledge of our Lord Jesus Christ. 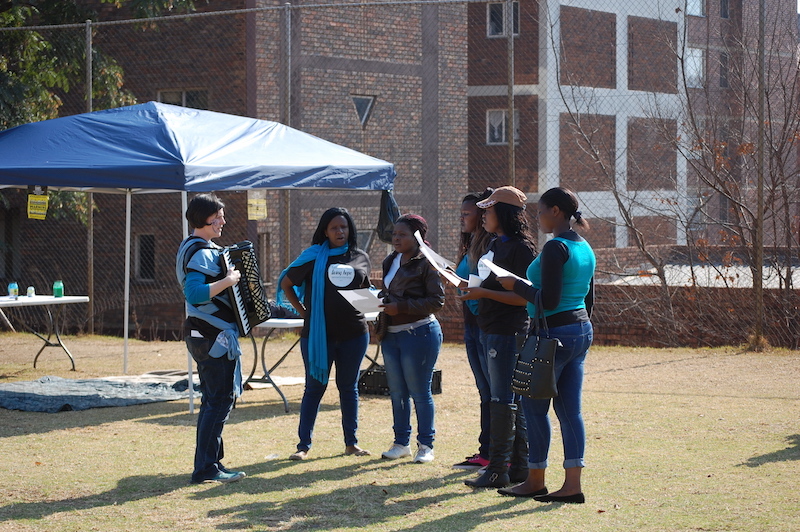 Other ways they are reaching out to their community are college campus outreaches, Bible studies, door-to-door, and men’s monthly evangelistic breakfast. Newton’s heart is, “for his people to come to correct understanding of the gospel and the implication it has on their everyday lives”. He says that main obstacle to this is “religion”. 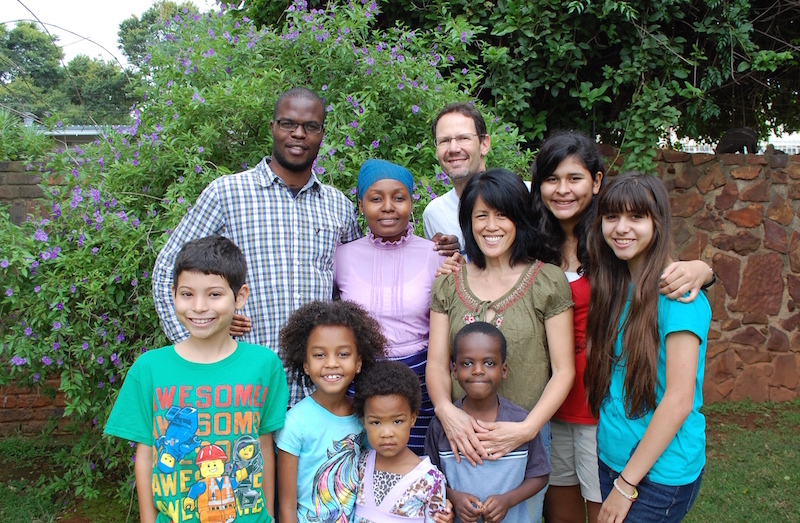 Please pray for the Chilingulos as they seek to further God’s kingdom in Lilongwe, Malawi. Our current baby home intern is Tabea from Switzerland. She is serving with us for three months, loving and caring for the babies and diving into the life of Living Hope Church! Ladies Bible Study continues as we are going through the book of Galatians. 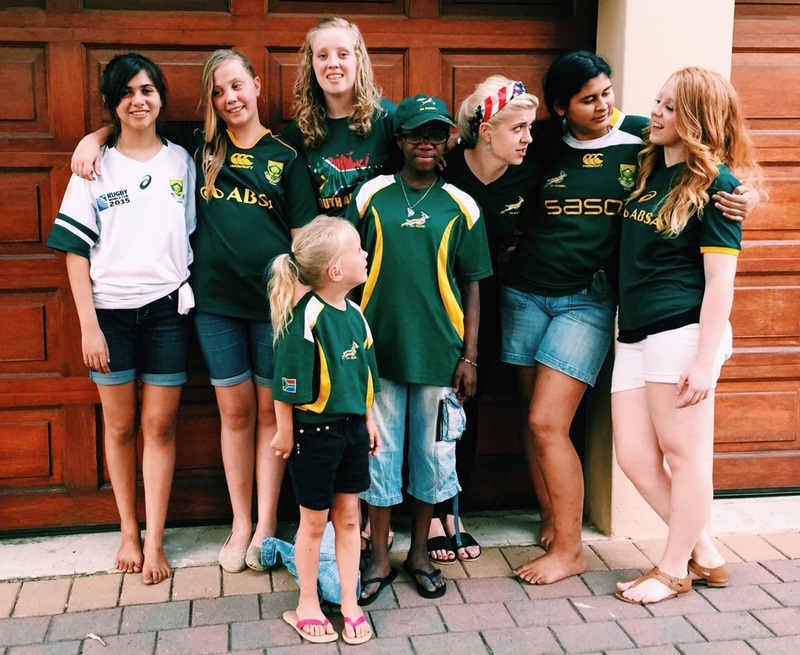 And finally, it is Rugby World Cup 2015 season and my children (at least Julia and Marissa) have turned against their home country in order to root for a winning team. Who can blame them when the USA vs RSA score was an embarrassing 0 to 64? Randy and I, however, tried to remained loyal in support for the underdog. On July 4th , while our American friends and family were celebrating their freedom with BBQs and fireworks, we celebrated the freedom we have in Christ as a church family by coming together for Living Hope Church’s first (annual??) Family Fun Day. With a volleyball tournament, relay races, dancing, a singing competition and more we spent the day just enjoying one another and the bond we have because of Christ. A fun day indeed!! Heather Drew and her girl band practice for the singing competition. Marissa with her BFF and other pals. The day was fun for the little ones, too! Volleyball brought out the competitive side of our otherwise very loving church family. 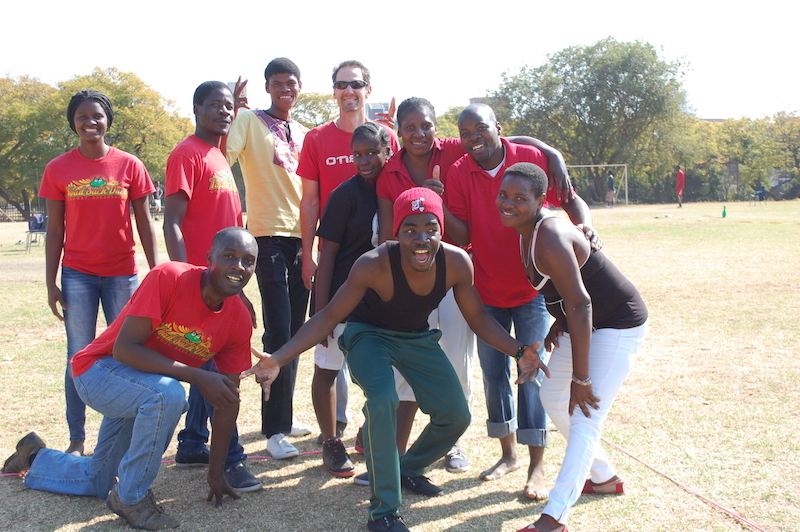 Red Salvakop reigned as volleyball champs. 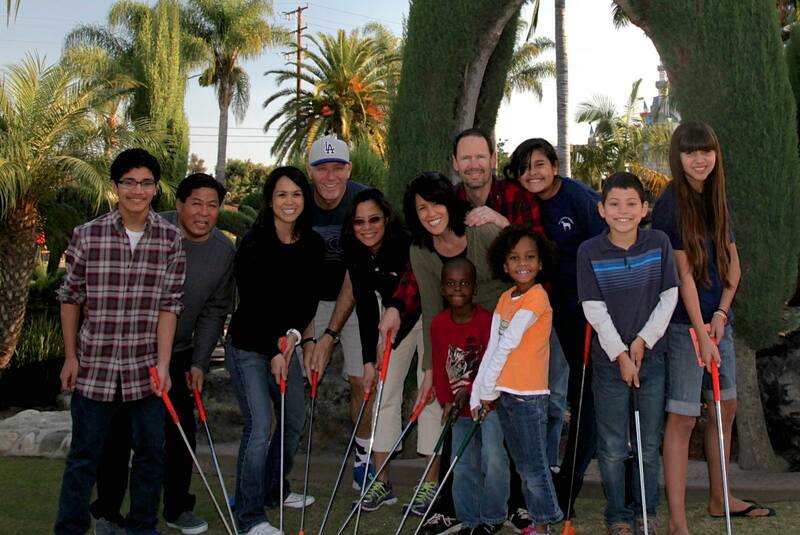 Living Hope Church’s first Fun Day family photo! 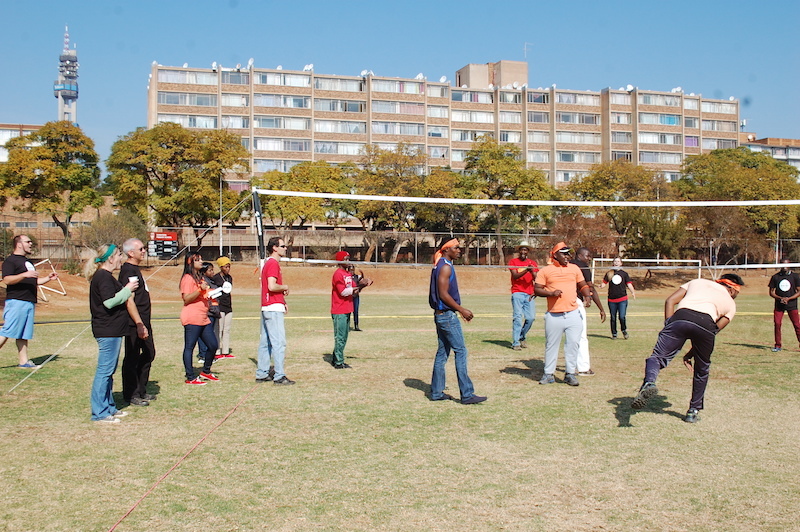 Park Outreach Every Monday late afternoons at Jacaranda Park, Sunnyside, Pretoria you will find a handful of Living Hope Church members playing volleyball or soccer with the intention of reaching out to the community to share the good news of the Gospel of Jesus Christ. Randy arrives early to set up the volleyball net and once the other Living Hopers arrive a friendly game is started, which inevitably attracts people walking by or those already sitting at the park to join in the game. After about an hour of game time, the players are gathered around to listen to a testimony or a gospel message, and scripture. Newcomers are invited to church on Sunday and contact information is taken for follow-up. This weekly outreach is one of the simple ways the Living Hope Church is “going into all the world and proclaim the gospel to all creation”. 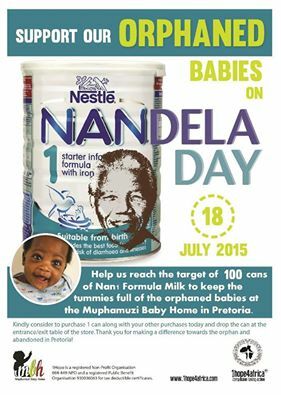 1Hope4Africa decided to turn Mandela Day into Nandela Day! Nan is the brand name for the popular baby formula here and on July 18, the 1Hope team hung out at local grocery stores speaking with customers about the Muphamuzi Baby Home and asking them for their support through the purchase of cans of Nan. 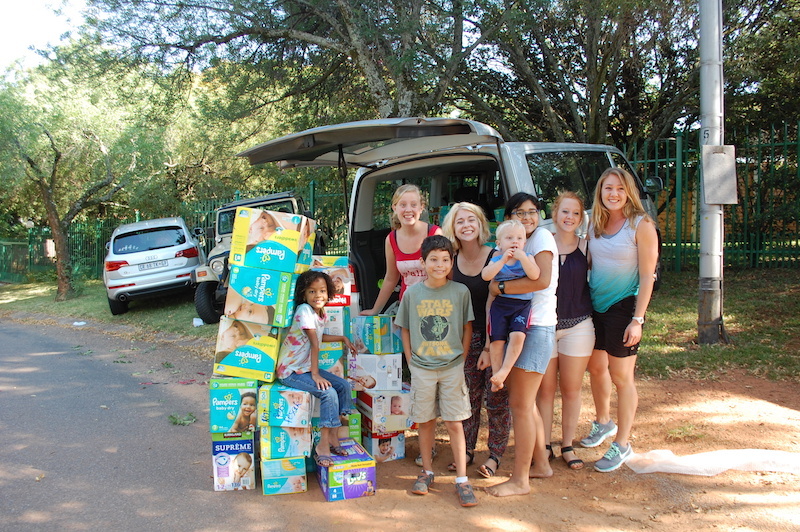 Different 1 Hope members were at two different stores on the morning of July 18th and together through cash donations and donated formula cans we raised R7000 (approx. 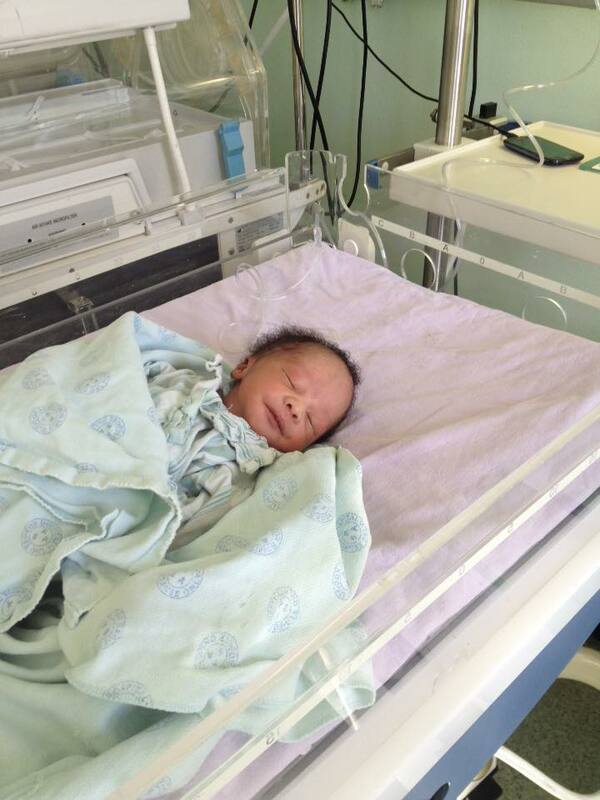 $600) for the babies being cared for at the baby home. Family Time Over Father’s Day weekend, our family enjoyed a quick time away to what is becoming an annual tradition to Kruger National Park. We came across all of the Big 5 with the exception of the very shy leopard, but we were able to catch sight of the even shyer cheetah! 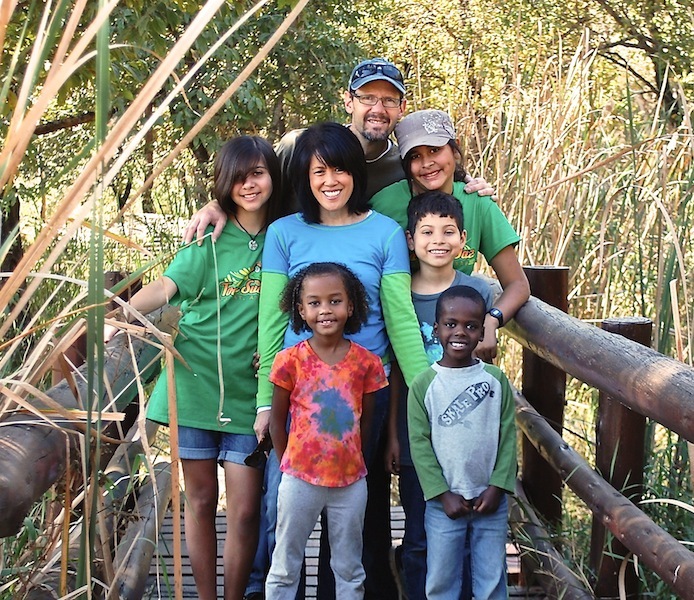 Our kids LOVE searching for animals in the African wild (from the safety of our car with windows closed) and we are so thankful for the fun and blessings of these adventures and time to be together as a family. Even though we saw lots of them, we never tire of watching the elephants! 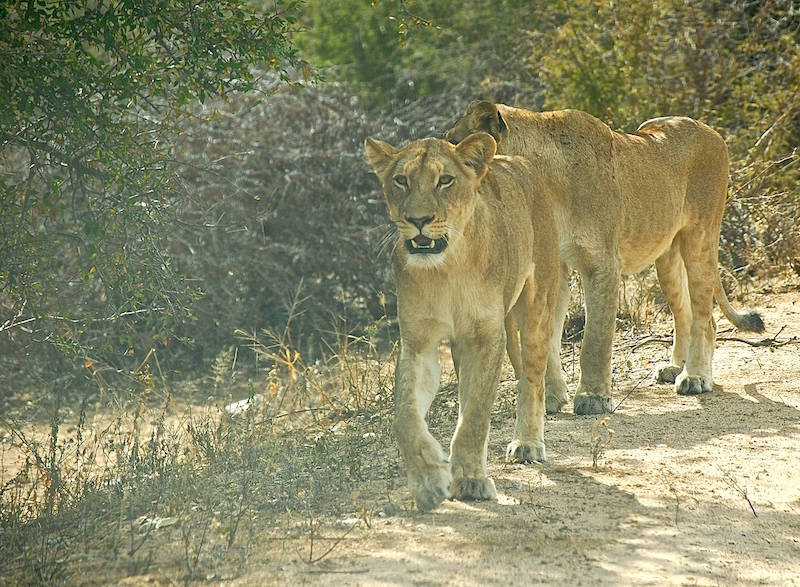 Two lionesses walking along the side of the road! Our accommodations had some of the tamer animals roaming about. 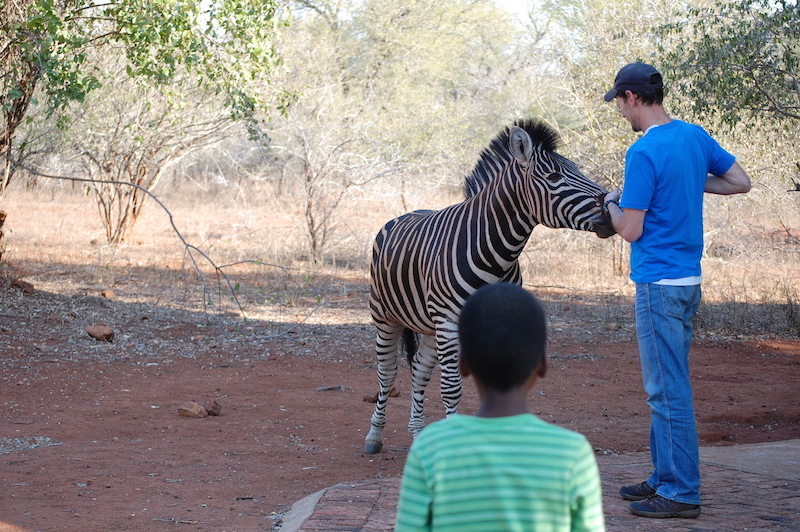 Randy gets a kiss from this curious zebra. Three years! The 20nd of this month marks the 3-year anniversary of our family boarding a plane at LAX bound to Johannesburg, South Africa. 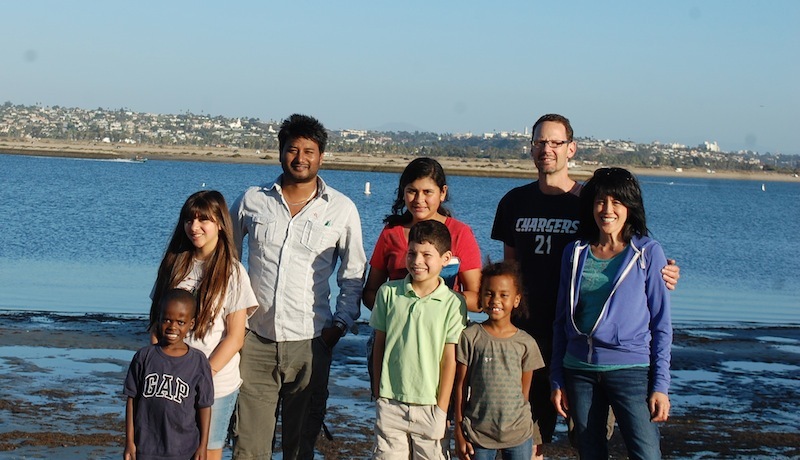 The intention was to serve with 1Hope for “a year” and return to our Orange County lives. But as we have said before and will say again, “The heart of man plans his ways, but the LORD establishes his steps” (Proverbs 16:9). We are humbled, awed and so very thankful that God would allow the joy of us, His weak, broken sinful children, to participate in the work that He is doing in this world. We are also so thankful to all of you who have prayed, participated and partnered with us! The Body of Christ is truly an amazing, powerful tool in the Mighty Master’s hand bringing about His plans and purposes. We do not know what the next three years will hold, but we are thankful to and put our trust in the One who does. We also cling to the amazing truth that for those who are in Christ, eternity with Him is promised. 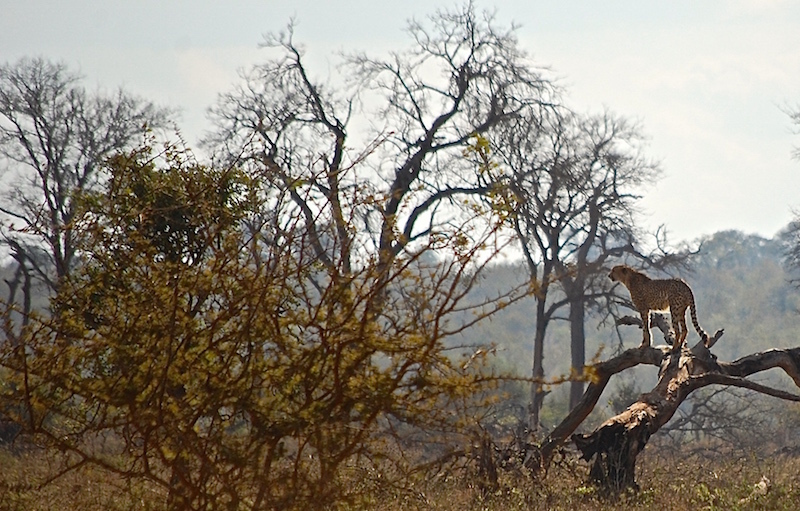 There is one spot in the Kruger where it is safe for you to exit your vehicle because there is a ranger with a rifle standing guard. As the first frigid cold front from the south hit Pretoria, the temperature plunged from a balmy, pleasant 80oF/60oF to a chilly mid 50’s in the day and freezing temperatures at night. With brick homes without insulation or central heating, during the day it is warmer outside than in and at night it is shivering cold no matter where you go! We have learned to cope as native South Africans do: by bundling up and wearing what we, at one time, called winter outdoor clothing (coats, boots, scarves) indoors. Discipleship Opportunities: Living Hope Church takes seriously Christ’s final charge to his followers when he commanded, “Go and make disciples” and as result we are a church of disciples making disciples. It is the goal that every faithful attender be involved in a weekly “Gospel Community” (small group) as well as individual discipleship relationships where we learn and help others to grow in faith by following Christ in all aspects of daily life. 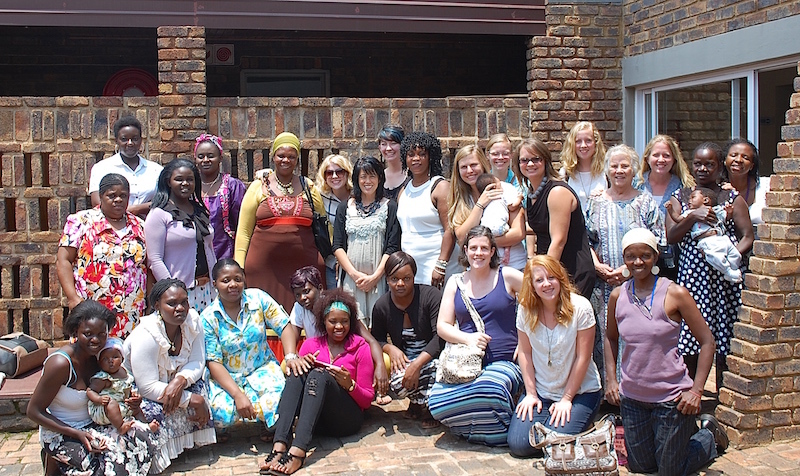 To that end, one major focus this year has been the launch of an official Ladies Ministry. Our larger whole church Ladies Bible Study of about 20-25 ladies meets every other week in our home and these past few months Marda Mack has been teaching us how to study God’s Word and the importance of allowing this Word to have a true impact in our lives. That we would not walk away from it as merely hearers, but doers. 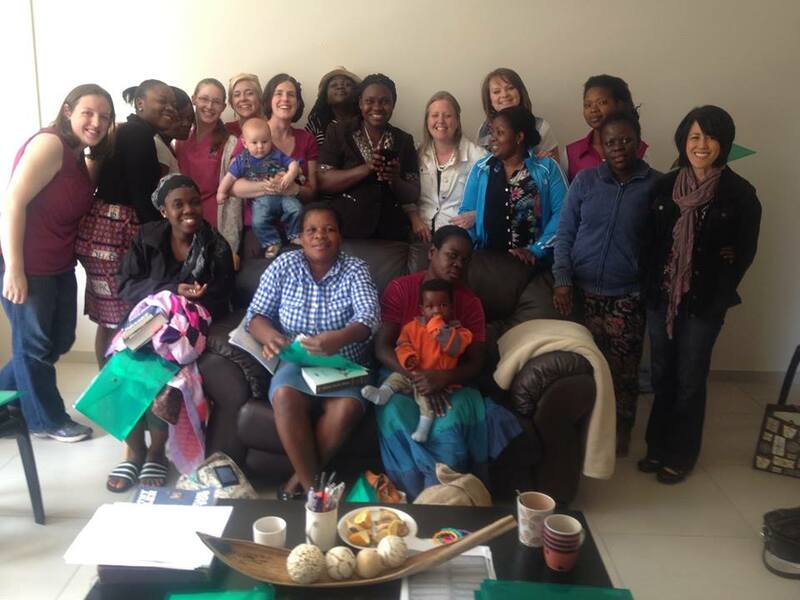 During the other weeks, I have had the joy and privilege of leading a smaller group of ladies that live and/or work at the Muphamuzi Baby Home. My love and affection for these ladies has grown so much these months as I witnessed these sweet sisters’ deep love for Christ and the gospel and desire to make much of Him in their lives. Many of them struggle deeply with difficult issues and are often tempted to take matters into their own hands, but by God’s grace, they stand strong in their faith, learning to depend on the provision of their heavenly Father. 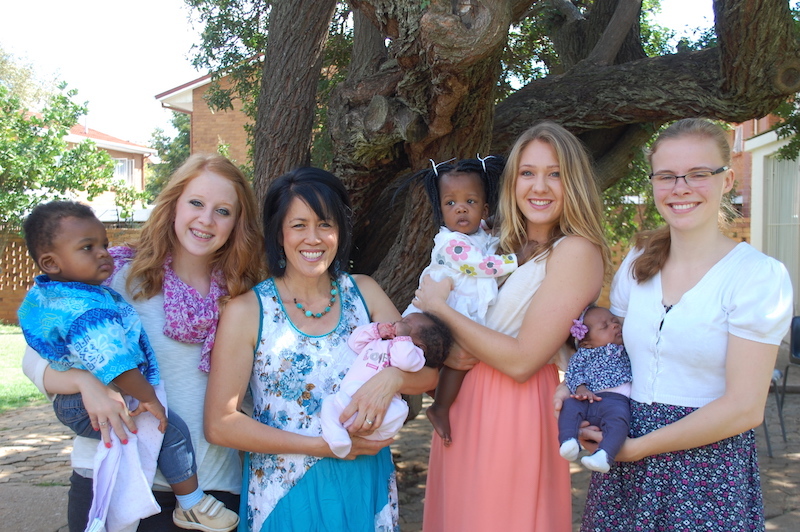 Small Group Ladies Bible Study is held every other week at the baby home. Love these ladies! One such young lady is Debra who is the daughter of MBH caregiver Linda whose story I have written about here. 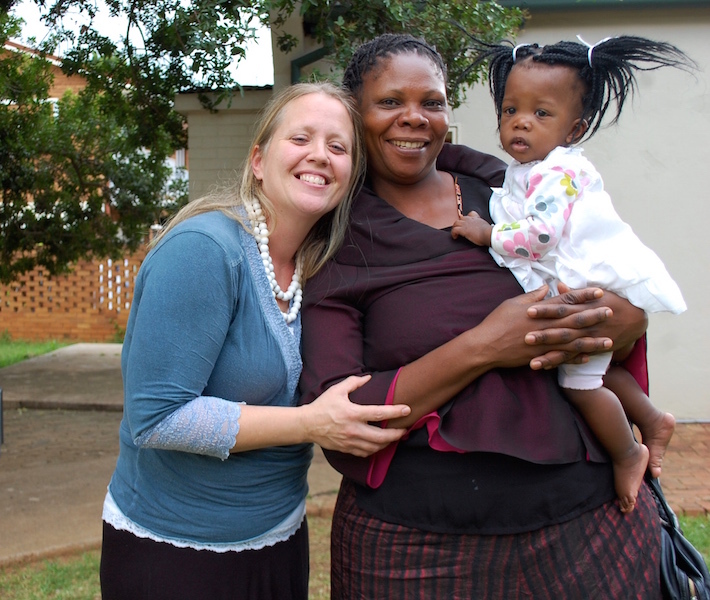 Debra has come to South Africa from Zimbabwe to join her mother last fall. She is a quiet deep thinker with a wonderful smile that lights up her whole face when I can get her to flash one. She works very part time at the baby home and in our home once a week. She desperately desires to go to school in order to gain skills that would afford her the opportunity to work and help provide for her family. Of course, money is very limited and the income she and her mother bring in does not allow her to pursue her dream. On her days with our family, Debra and I sit down at lunchtime and are reading through the Gospel of Mark. Debra always expresses a deep desire to reflect her Savior to the world and to grow in her dependence on Him. Recently, Debra shared with me that her older step-brothers set out to help her in her job search. In their opinion, their efforts were successful as Debra was offered a job as a waitress in a restaurant. The only difficulty was that this position required serving alcohol in a bar and having to work on Sundays. She was so conflicted and her brothers urged her to take the position, that she had “no choice, she must take the job”. But after much consideration, Debra firmly believed that as a follower of Christ, this position would not reflect her Savior, and although she was very tempted when the employer phoned her a few times, she refused the job. Contrary to her brother’s words, she did have a choice and she chose to trust in God’s provision rather than compromise her convictions. Please pray for Debra. The church she attended previously in Zimbabwe did not handle God’s Word accurately and she is eagerly studying the Bible with a new deeper understanding of the true gospel. 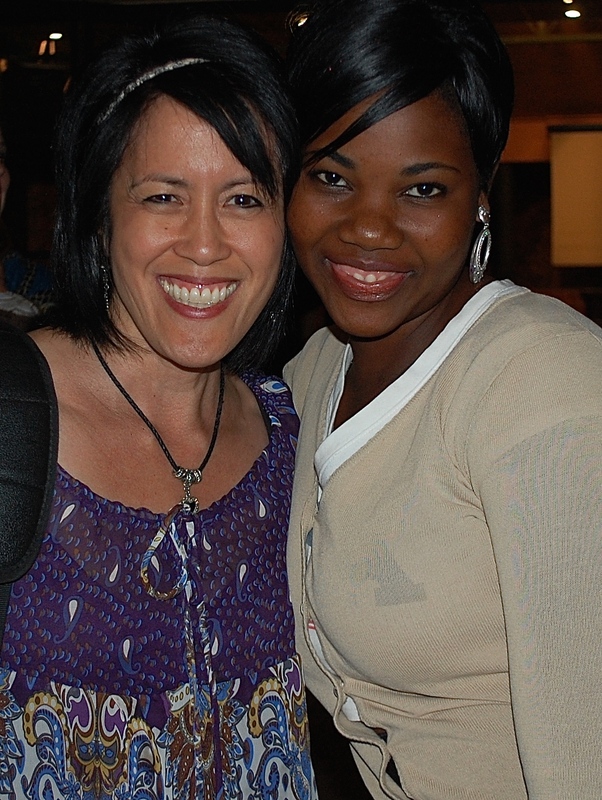 It is a joy and privilege to watch Debra grow in her faith! 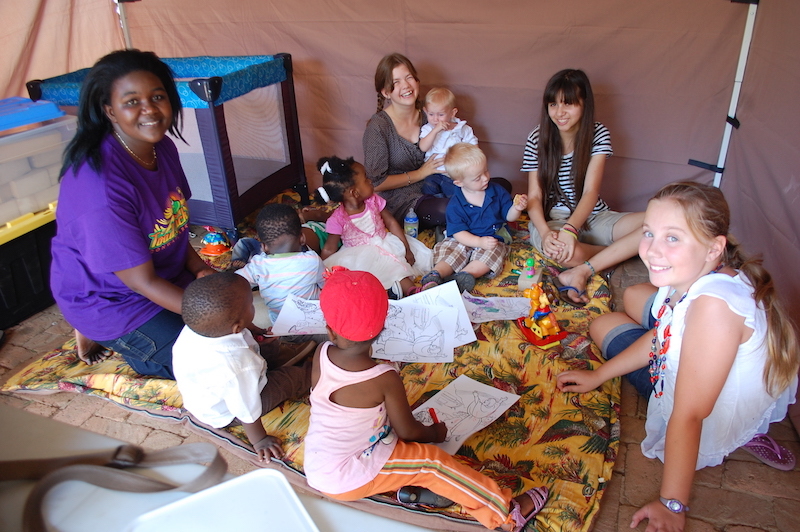 The Muphamuzi Baby Home celebrated its third year since its opening which equates to 34, 380 nappy (diaper) changes! 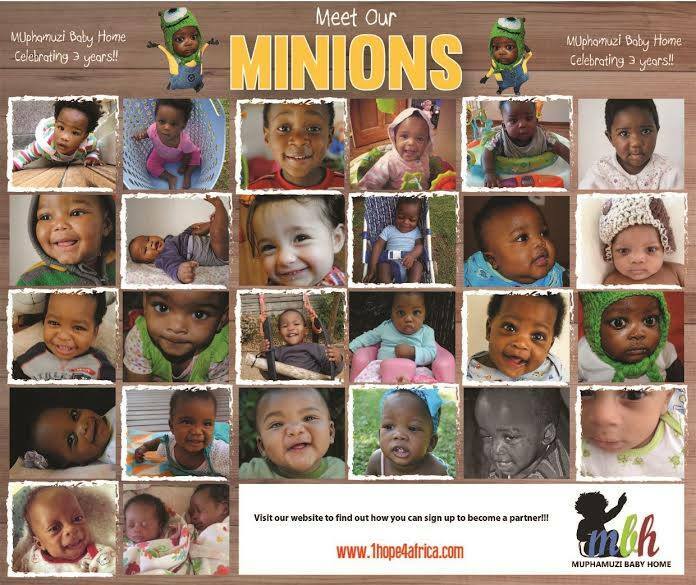 The precious faces of the little ones the Muphamuzi Baby Home these past three years! Please pray that God would continue to provide for the running needs for the next three years and beyond! GCO Interns – For four days in June, the MBH had the privilege of hosting three interns from our very own Grace Church of Orange. So fun to have these young ladies here sharing in the life and activity of our church as well as helping with the care of the babies at the baby home. 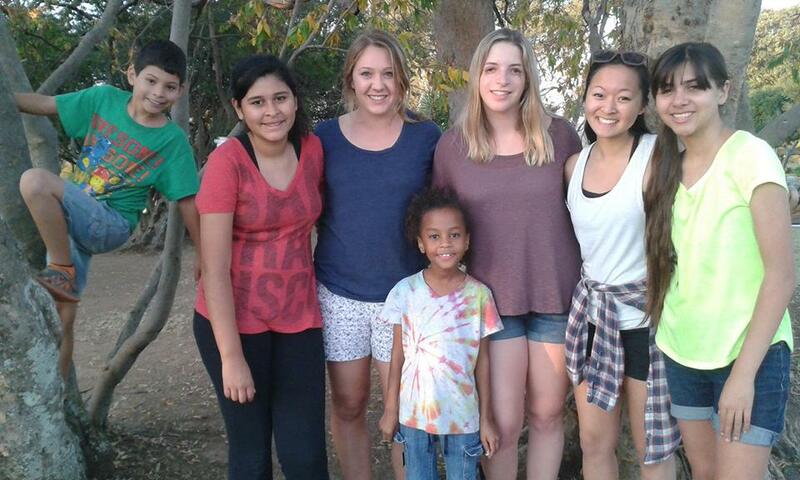 Clark Kids with Grace Church of Orange interns (from left to right): Alli Sciarra, Abbey Quinn, and Deborah Loo. So thankful for these ladies and their hearts to serve. 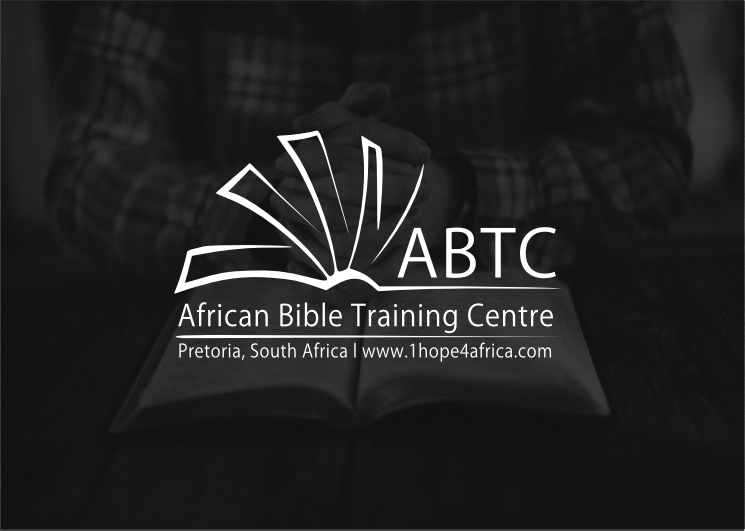 African Bible Training Center– The classes for this two year course surveying the entire Bible has approximately 50 students attending every other Thursday, eager to understand more deeply God’s Word. This course is so necessary as false religious teachers abound in Africa with many self proclaimed “Apostles” using their influence and slight of hand “miracles” to prey on desperate followers yearning for a more comfortable life. Half of our class last Thursday was in the dark, but not because passages we were studying were particularly confusing, but because we were literally in the dark. Halfway through the class that evening the power went out. The demand for electricity in South Africa far outweighs its supply and this country is currently experiencing a power crisis. As of November of last year, in an effort to reduce demand, Eskom, the country’s electricity supplier, has scheduled daily rolling blackouts throughout the country known as “load shedding”. That evening the anticipated blackout occurred right on time. We, however, were prepared and the class, was only briefly interrupted as we took a few minutes to turn on flashlights and bring out cell phones. The class continued and that evening we reviewed that Leviticus sets us up for the gospel by showing us God’s demand for holiness and Christ’s fulfillment of this demand by being the ultimate, “it is finished” sacrifice. We also learned that through the book of Numbers and all the censuses that were taken, God shows us that He is able to fulfill the promise he made to a childless Abraham who, gazing at the stars against a dark sky, believed God when He said these points of lights would represent the number of his future descendants. Despite a thunderstorm that brought a downpour of rain, on March 1st with hearts overflowing, we celebrated as our Julia Faith made a public profession of her faith in Christ Jesus through baptism along with three other sisters from Living Hope Church. The Apostle John put it well when he wrote in 3 John 1:4 , “I have no greater joy than to hear that my children are walking in the truth.” Truly, as a parent, there is no greater joy! 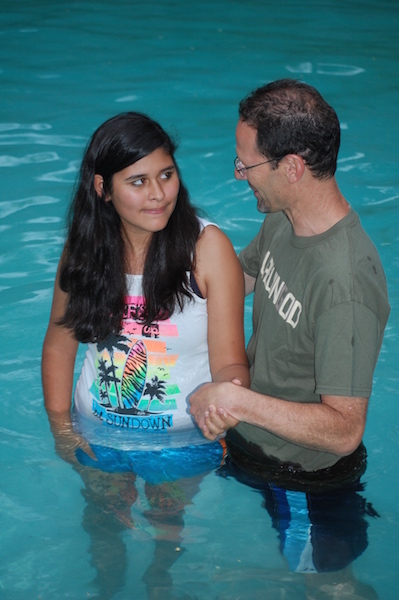 Please pray for Julia as she has a lifetime ahead of walking with God and growing in her faith. Larissa, Nomatter, Julia and Gertrude just after their baptism. To God be the glory, great things He has done! 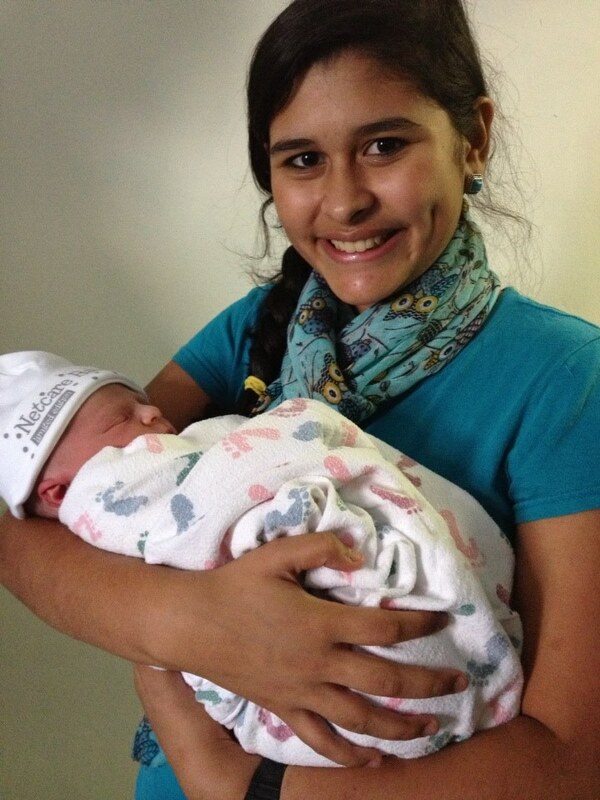 Julia with her birthday buddy, Jensen Isaiah, only hours old! Our growing church Julia celebrated her 15th birthday on March 14th and her birthday wish was to have a “Birthday Buddy”. Heather and Donovan Drew our co-workers and fellow missionaries were expecting their 3rd child who was due March 10th. God was kind to Julia and granted her birthday wish as Jensen Isaiah Drew entered the world on Pi Day (3.14.15). Our New Home We are so thankful that God has provided us with an amazing home here in Pretoria and our deepest desire is that it will be used for His purposes and glory. We are blessed to be living in community, sharing our property with our co-workers and dear friends. Andre and Karlien DeWit and their two adorable children have made their home in the one-bedroom flat adjoining our home. Living Hope Church has been praying for years to have its own facility, but for now, as we continue to rent our current facility,we are so happy that our home can be utilized for different church events such as communion service and Ladies Bible Study. Living Hope Ladies Bible Study meets in our home twice a month. 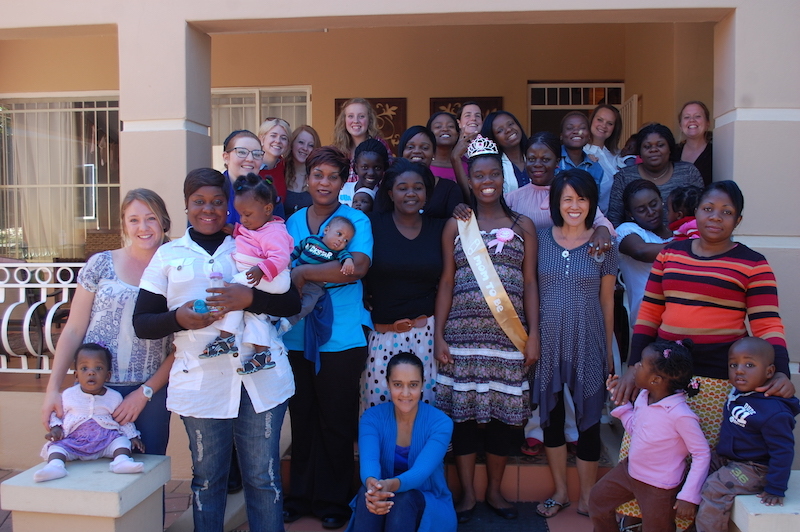 This last gathering was a celebration of our sister Lerato’s upcoming birth as she was showered with love and gifts. Can you guess which one she is? 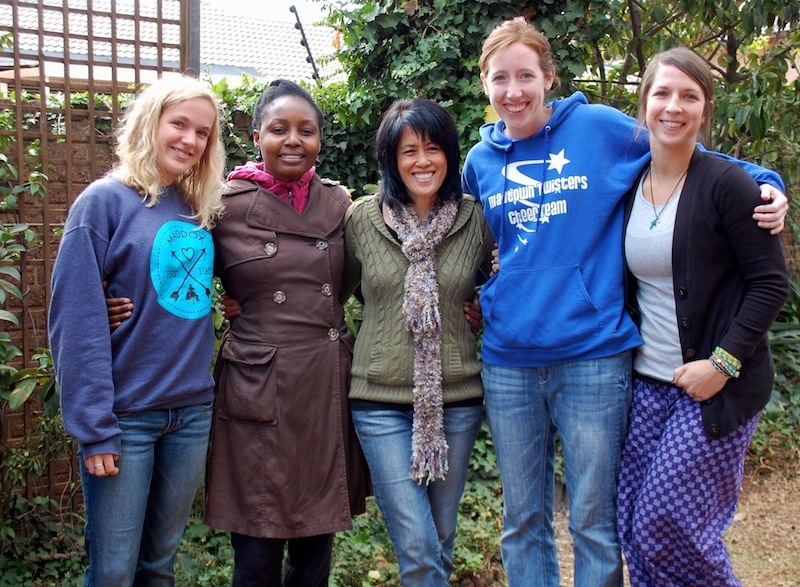 Last month we were also privileged to once again host Mary-Kate Martin director of Hosea’s Heart (a ministry in Swaziland) and her interns for a long weekend as they travelled to Pretoria for some very needed rest and relaxation. 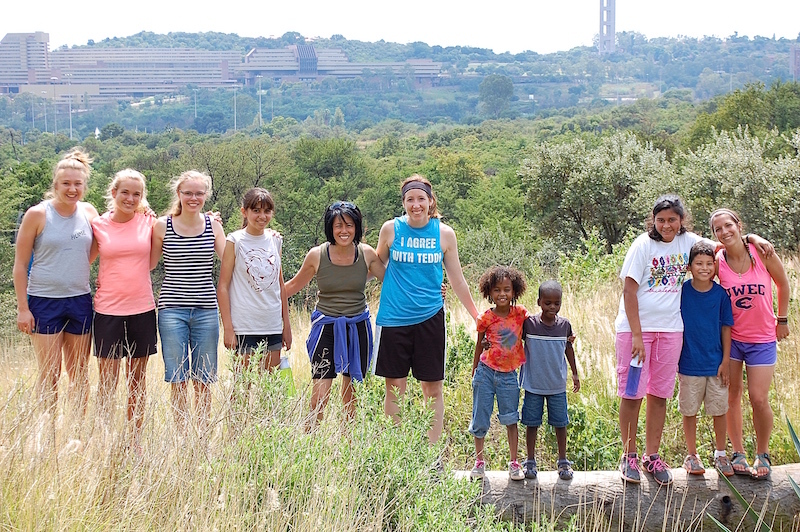 Hosea’s Heart Missionaries and Muphamuzi Baby Home interns out for a hike in the nature reserve just outside Pretoria. University of South Africa in the background. Resurrection Sunday – What incredible joy it is to gather as the body of Christ on Easter Sunday and celebrate the risen Christ. A foretaste of what is yet to come because of Christ’s victory over sin and death. We had two services: an Easter Dinner the Saturday before and our Resurrection Sunday service. In order that we, as a church family, could include Baby Home caregivers and interns, the babies from MBH joined us for both church services. Celebrating Easter Saturday as a family in Christ! Baby Home babies join us for our Easter services! Guess which two are the new twins girls? 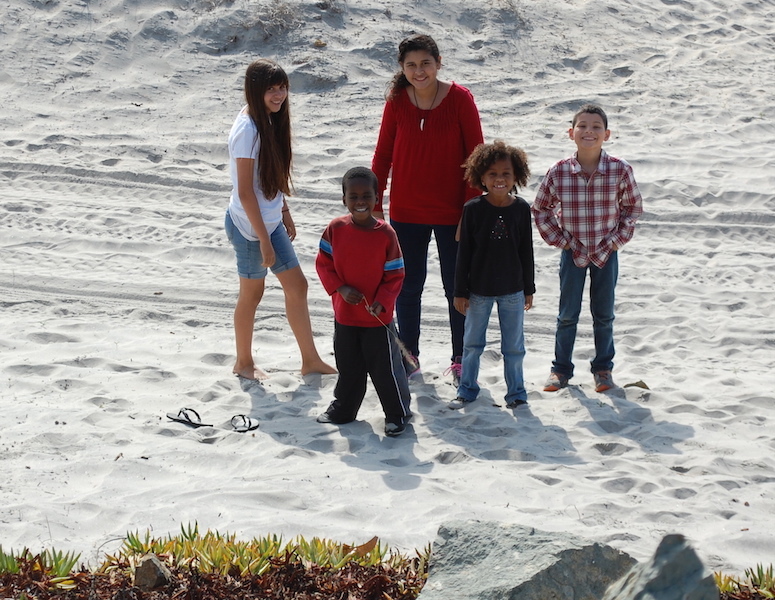 Baby J on the far right, was just welcomed by his forever family. 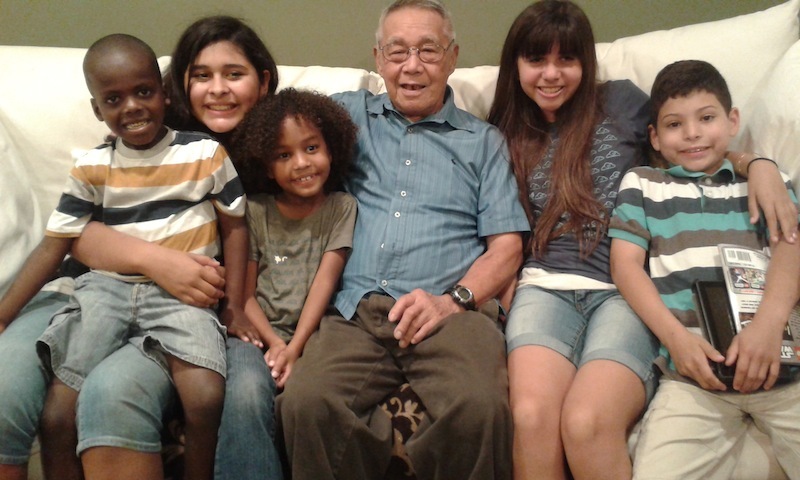 Although he will be missed, we are so thankful that God has placed him in his family. This little guy (with caregiver Joy) recently had surgery to repair a birth defect that made it difficult for him to breath and eat. Thank God, he has recovered well and is now eating and growing! 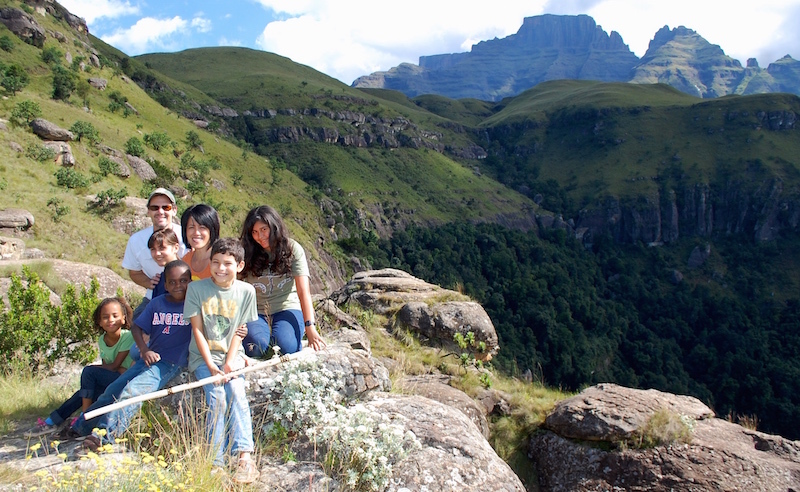 We enjoyed a quick “holiday” hiking in the breathtaking Drakensberg Mountains. A glimpse of our Creator’s majesty and glory! 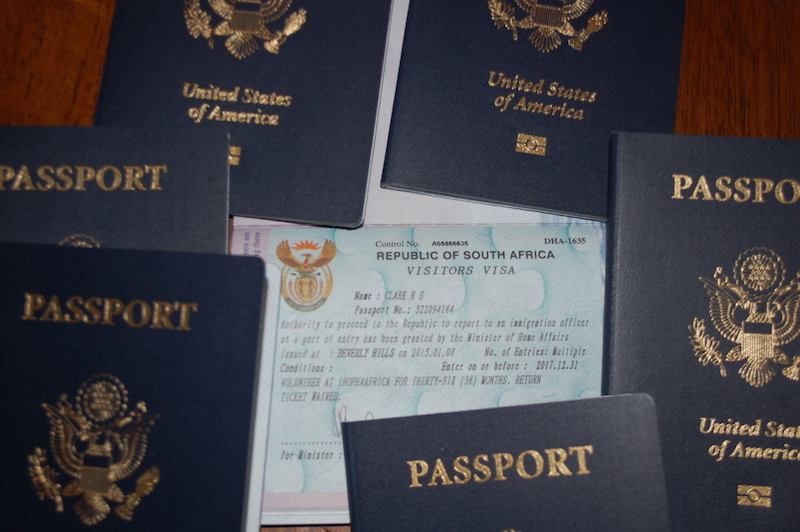 We have been settling in to our new life in Pretoria, South Africa for just over one month, but it has been incredibly filled with the things of life (a week of jet lag, four weeks of kitchen construction, a couple bouts of the stomach flu, a trip to the emergency room for a concussion, unpacking our things from our shipping container and lots of new ministry opportunities) that it seems as if we have been here for several months. I went to the Registrar and received the registered adoption order that says “According to the provisions of Section 242 of the Children’s Act (Act No. 38 of 2005), your adopted child is now for all purposes regarded as your child as if born to you and you are now for all purposes regarded as the parent of the adopted child”. SOLI DEO GLORIA! 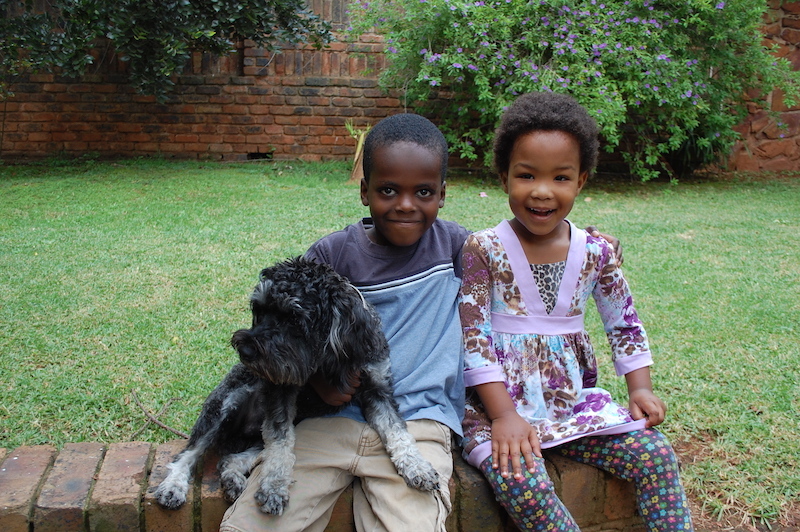 Chisomo with Elijah and Sammy in our backyard. The Clarks with the Chilingulos before they head back to Malawi. Ladies Bible Study – Our prayer for the ladies of Living Hope Church comes from Ephesians 3:16-19): “that according to the riches of his glory he may grant you to be strengthened with power through his Spirit in your inner being, so that Christ may dwell in your hearts through faith—that you, being rooted and grounded in love, may have strength to comprehend with all the saints what is the breadth and length and height and depth, and to know the love of Christ that surpasses knowledge, that you may be filled with all the fullness of God. Ladies Bible Studies are meeting weekly alternating between a large group and smaller groups. Nursery and Pre-School Sunday School – In the past, mothers of young children found themselves sitting on the lawn just outside the church building during the Sunday service trying to catch a bit of the sermon in order to not disrupt Pastor Josh’s message. But with the launch of our new Children’s Sunday School, these mothers are now able to relax and enjoy the church service knowing their children are lovingly cared for. African Bible Training Centre (yes, “center” is spell that way here) – During 2015-16, 1Hope4Africa will be teaching a foundational course on an overview of the entire Bible. 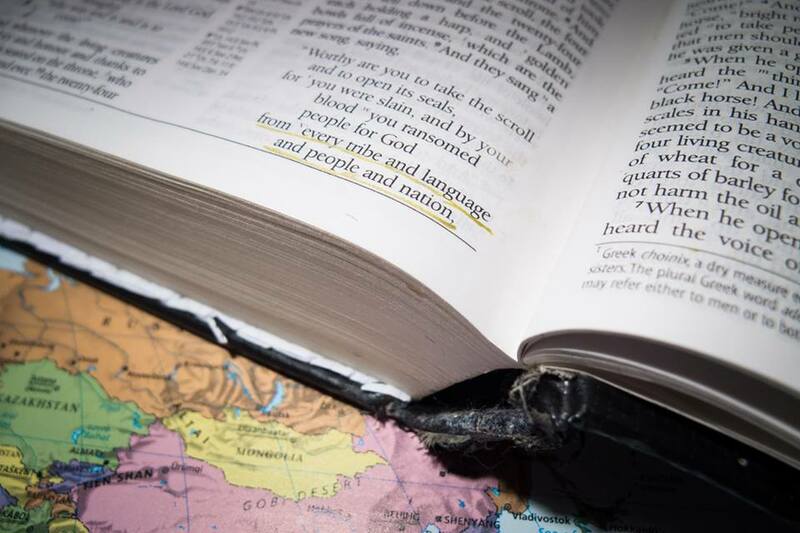 The purpose of this foundational course is to help students understand how the Bible works and what the Bible is about so that they will benefit from it and be able to explain the purpose of the Bible to others. Both Randy and I are taking this course and learning so much. African Bible Training Centre- We will be getting an overview of the entire Bible during the next two years. 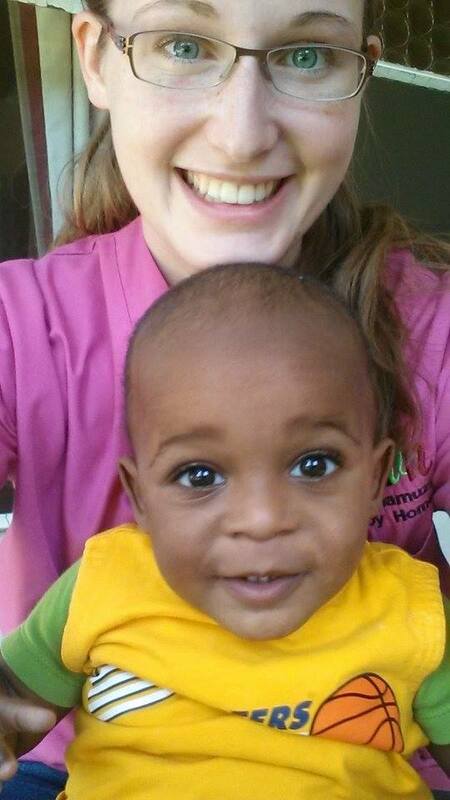 The Muphamuzi Baby Home internship Program continues and currently 1Hope is hosting two interns. 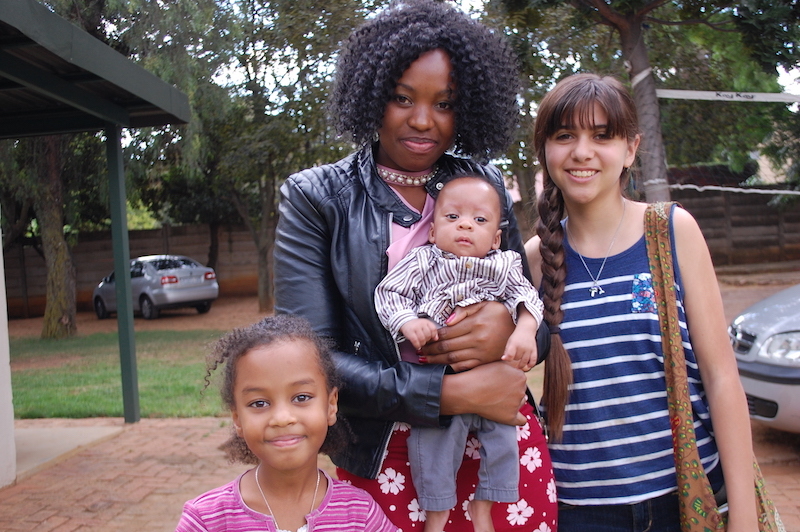 Hannah Hochsmann, a sweet God-loving 19 year-old from Germany, who flew in on our same flight from Frankfurt to Johannesburg, will be serving at the baby home until April. Hannah is 2nd from the left. Alli Sciarra (eldest daughter of Mike Sicarra who pastors our sending church, Grace Church of Orange) has been here since the middle of January. When Alli’s spring plans for graduate school did not work out, she decided she would like to use the time to serve in some way. Her brother suggested the baby home, but her first response was not in favor of this amazing life-changing option as babies are not really “her thing”. 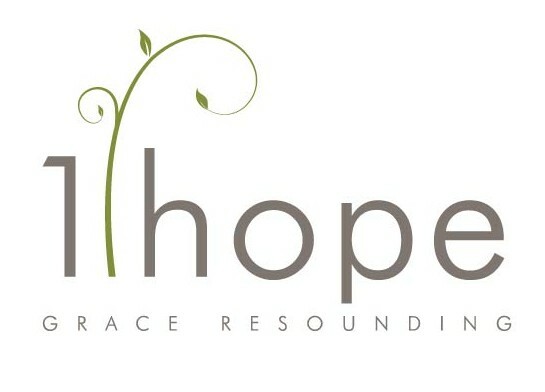 However, as she prayed and read through 1Hope4Africa’s website, the idea began to grow on her. 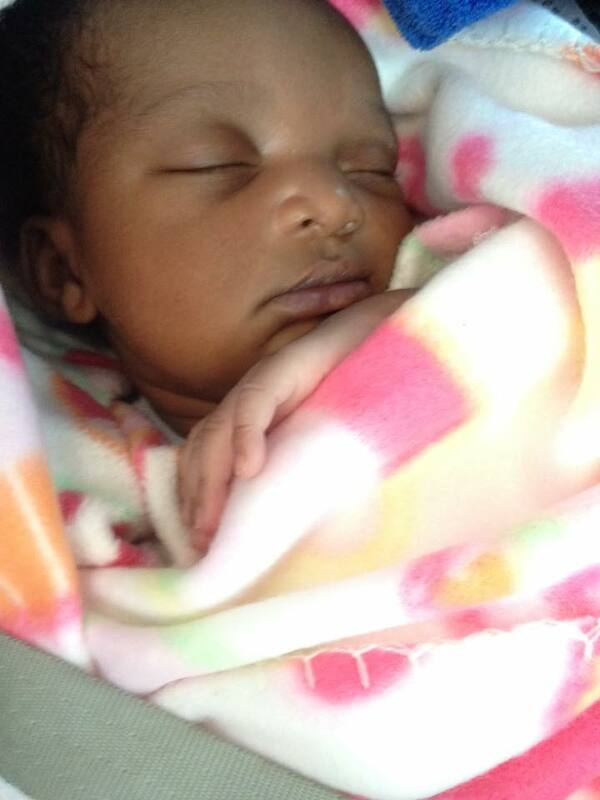 When she told her parents about the possibility, her mother said, “The Baby Home? 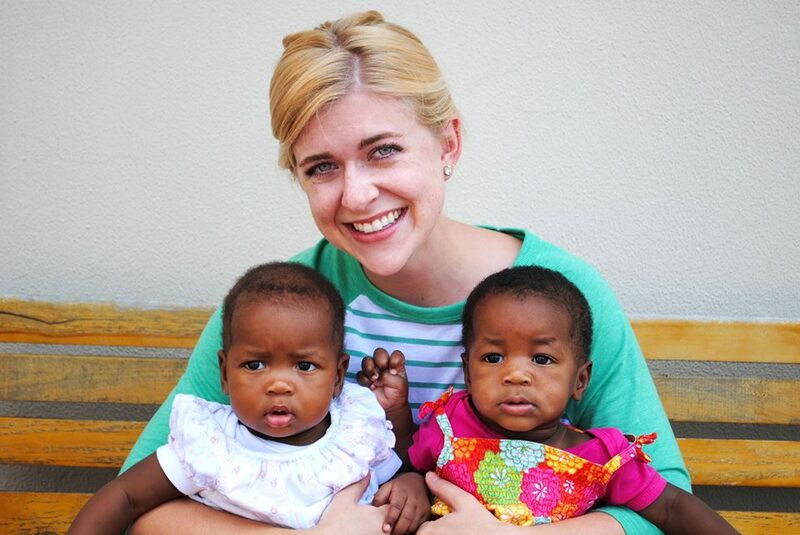 You know that means you will be working with …babies?” But the Lord put in Alli an excitement about joining our ministry for four months and she has valiantly been caring for our four little ones currently at the baby home. In the weeks that she has been serving here, God has been graciously teaching her what it means to sacrificially give of time and service and she is has genuinely grown to love the babies. 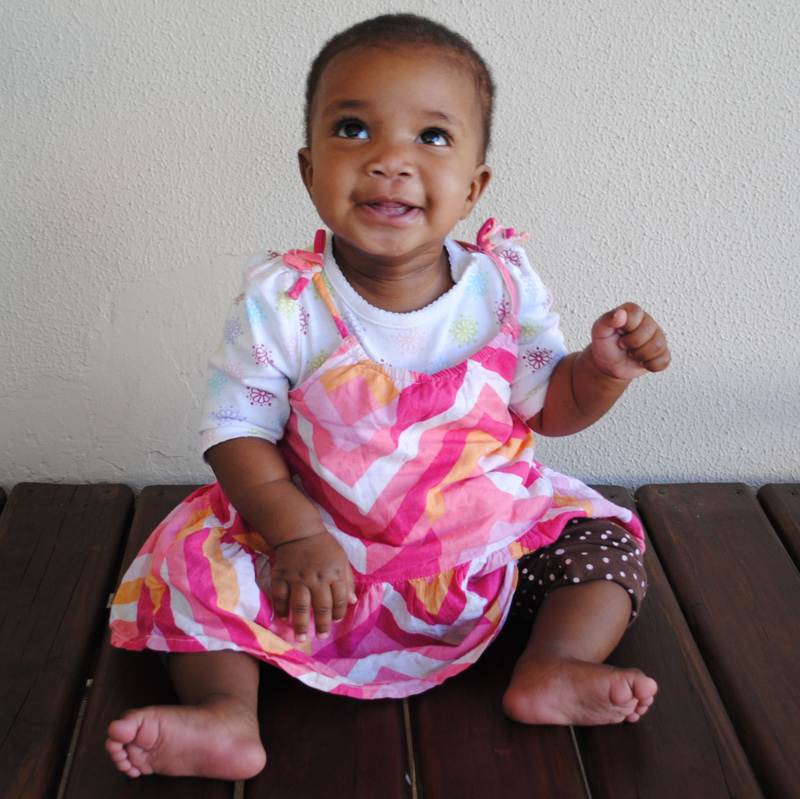 The Muphamuzi Baby Home internship program is vital to the success of 1Hope’s endeavor to care for vulnerable babies. The interns help keep the running cost of the home down while maintaining a high standard of care. We are thankful for both girls who are currently with us and are praying for God to continue to provide young ladies willing to serve Christ in this way. For more information click here. Last Friday, the 13th was our “lucky” day. At about 6:45 am, without the promised “we will let you know when it is on it’s way” phone call, our shipping container with our belongings and ministry donations that we packed and sent off in December of last year, arrived. From Long Beach it sailed to San Francisco, then crossed the Pacific Ocean to Hong Kong where it transferred vessels, then down to the port city of Durban, South Africa and finally, to our front door in Pretoria. We were given four hours to unload, but with the help of a construction crew from Germany who are here currently working with 1Hope on a building project , the entire contents of the 40 foot container were unloaded in an hour and a half! 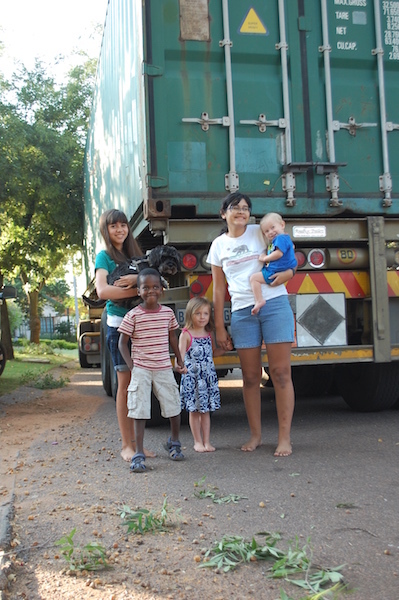 We are so grateful that God graciously provided for us in this way and allowed our belongings to follow us to South Africa. We give praise to God, from whom all blessings flow, for what He has accomplished in our lives to bring us to this place and point in our lives. SURPRISE! Early morning arrival of our shipping container! 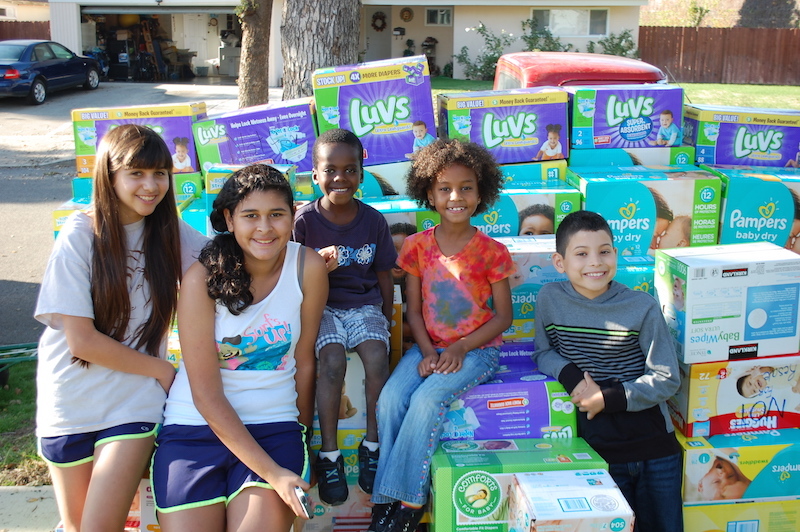 Donations of baby supplies were loaded up to be taken directly to the baby home. Container is emptied in record time with the help of our German friends! 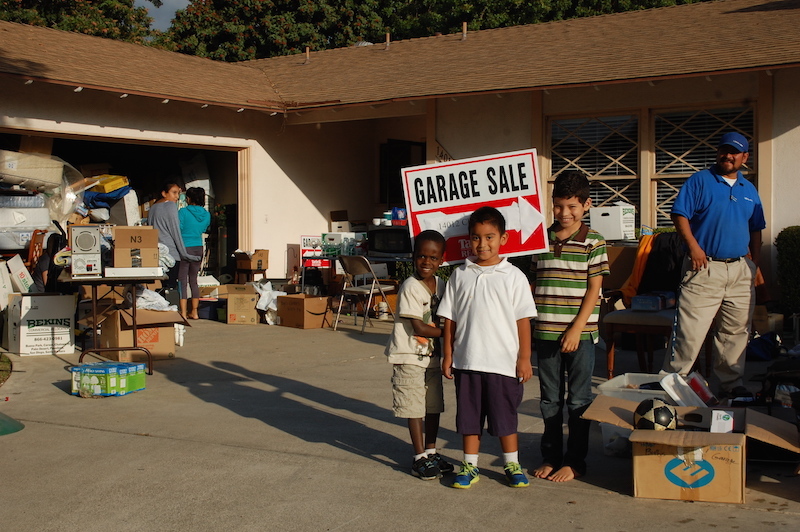 After going through all our “stuff”, we held a couple of Garage Sales. 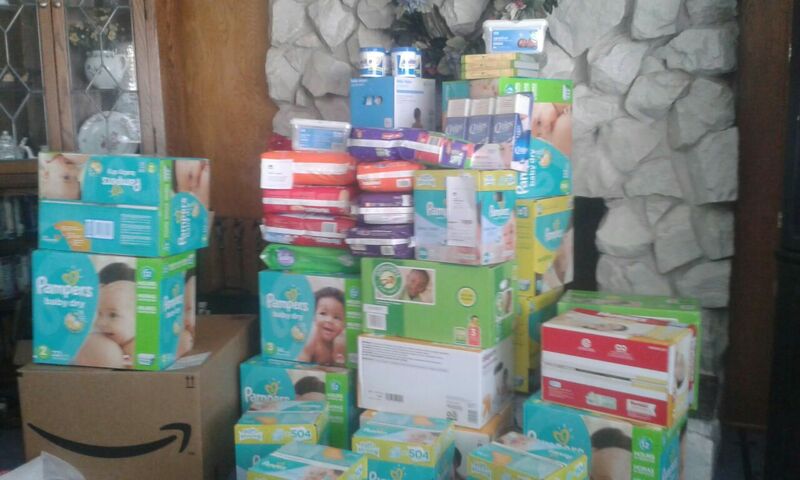 We collected baby home supplies and books for a church library. 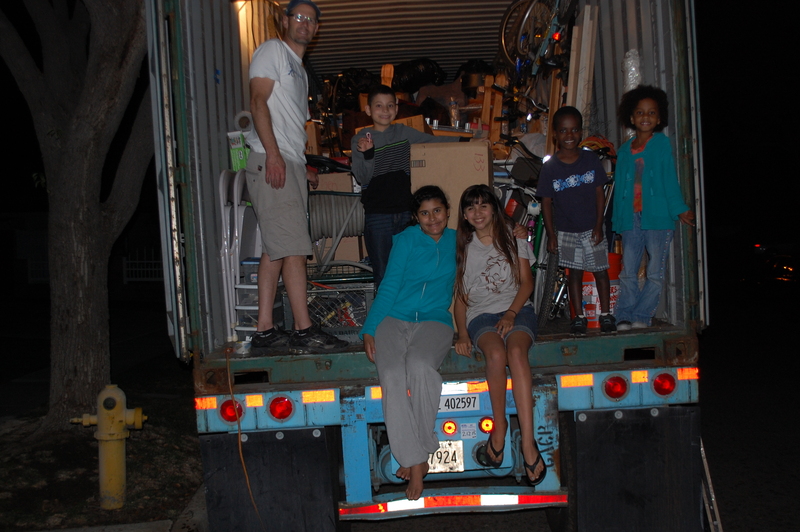 We packed up a shipping container with belongings and donations which is now somewhere at sea. And had several friend and family reunions. I read an article title, “Gospel People Say Goodbye” by Jared Musgrove, from the Village Church blog, awhile ago which I would like to repost here because it reflects my sentiment well. We are a church that is saying goodbye with much more frequency. To some good brothers and sisters. It’s never easy. Especially when you are seeing godly people in your life go. Some of us are better at goodbyes than others. Some are quick to say goodbye. Rip off the Band-Aid. Fare thee well. That’s life. Others say goodbye several times, intended or not. Like saying “good night” before you both realize you’re actually headed toward the same elevator, this may or may not be a gift of anything but awkwardness. Then there’s the couched-in-familiarity “see ya later” final greeting, both of you pausing for a moment after you say it, realizing that, well, you probably won’t. We are all somewhat clumsy with our farewells. Probably because they reintroduce us all over again to the fact that we are not in ultimate control of our lives or of anyone else’s. Yet, saying goodbye is the way of the sending church. In my own heart, I’m very prone to want to keep my community to myself and not share them. And the book of Acts presses me on this preference. A few years ago, I got to Acts in my Bible reading plan and, though I didn’t go in looking for this, what was revealed to me was a repeating pattern: As Christ is building His church, He brings His people together in groups for a time, for seasons, to accomplish kingdom work. Some stay together to nurture the work. Others are called out to start still other works. Two thousand years later, this is still the ebb and flow of healthy Christian community. Truth is, godly people hold one another with an open hand. Godly people who are about the gospel say goodbye often, confident in our union together as the family of God and confident that we will celebrate again. We WILL see one another again at the marriage supper of the Lamb. We will be with God together. For all time. But now, just for a little while, we have little time to waste. The Great Commission overrides any attempts to build our own little castle of community we want to rule over. God is so much greater. We’re called to hold one another with an open hand. This is the legacy of disciple-making into which the first disciples were called—a call that still resounds. We are part of an ages-old, ongoing, epic work of the Creator God, Whose image we bear, who is transforming us still by His work in Christ through our Christian community. It says something about who we are as the body of Christ that we have said many gospel goodbyes. Christians living rightly consistently say goodbye. No one in our lives is with us constantly, save for the Lord Jesus by His Holy Spirit. It is in this that we trust, as we say our goodbyes with great hope. 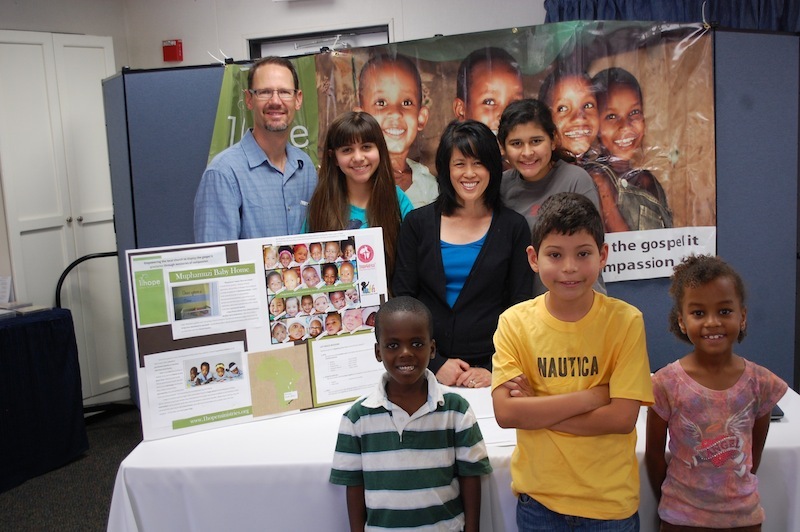 Sharing 1Hope at an Orange County Orphan Care Summit. Spending time with beloved Papa! sorting and sorting and more sorting as we sort through all the belongings we have had in storage for the past couple of years. Elijah finds a long lost favorite toy! 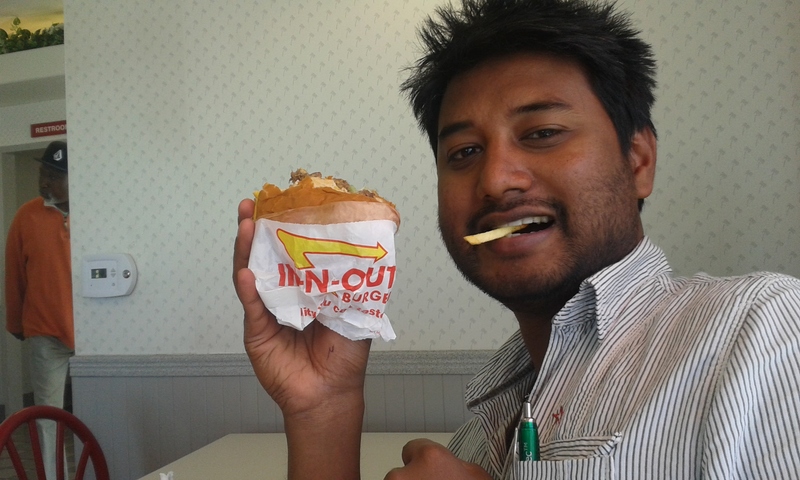 South African, Hamilton, receives the In N Out experience for the first time! 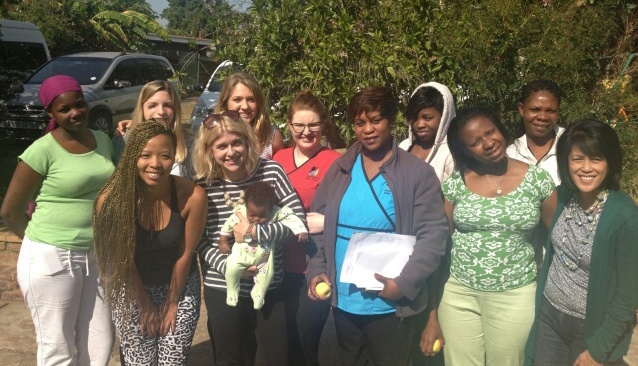 The month before departing South Africa was also a whirlwind for us. 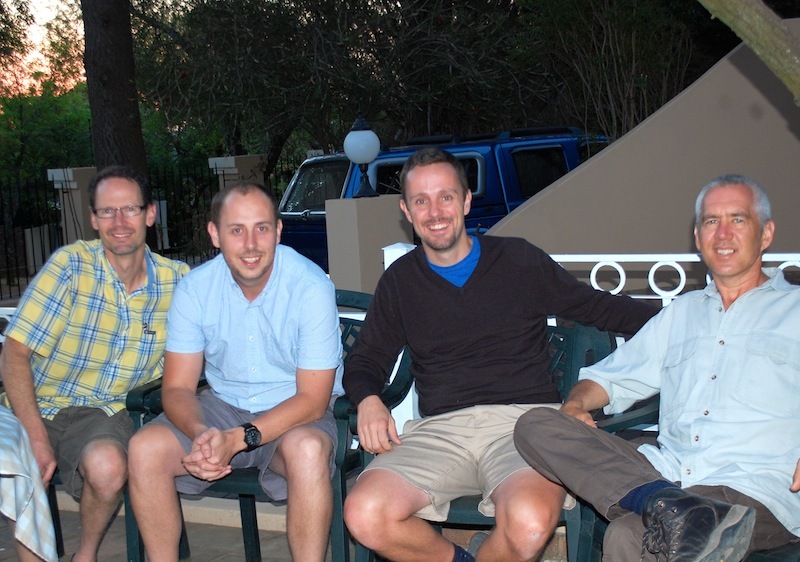 We moved from our rental into our new home in Pretoria, unpacked as many boxes as possible and then said good bye to our dear friends and ministry partners. Our “moving in” ritual, Randy carrying Susan over the threshold. 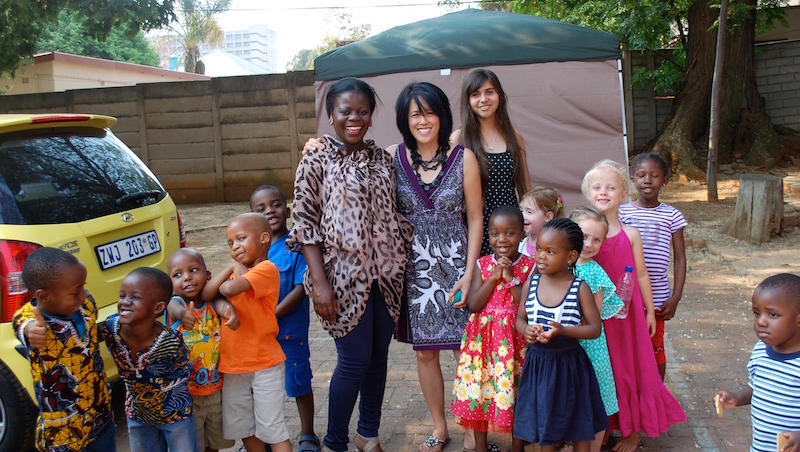 Our new Pretoria home is a wonderful gift and blessing from God. 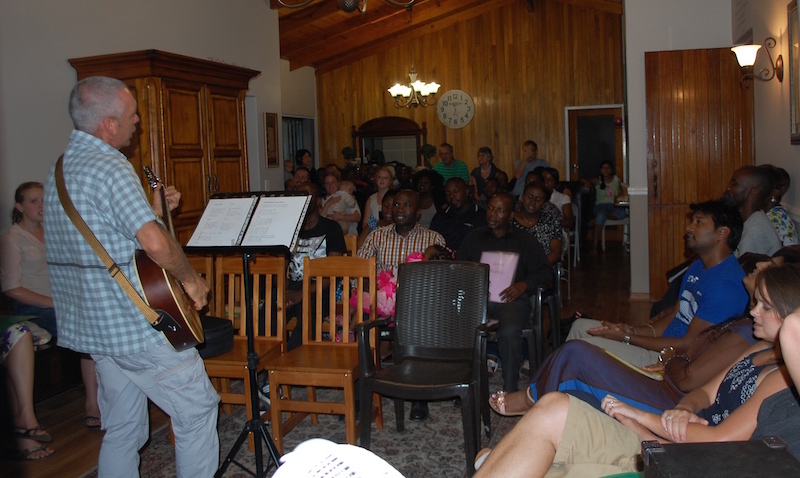 On the property is a one bedroom flat (apartment) which has so many possibilities for ministry. 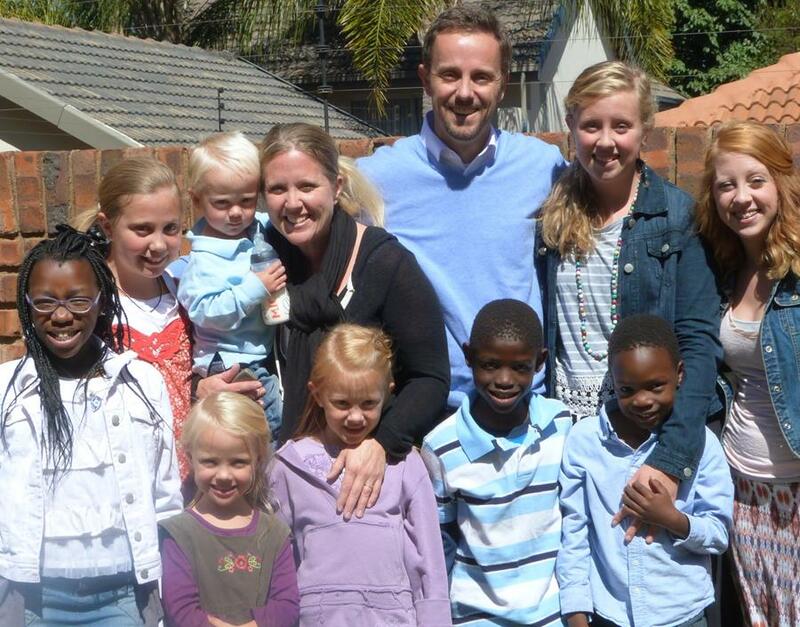 But for the next year or two our dear friends and ministry partners, Andre and Karlien DeWit have moved in with their two beautiful children. 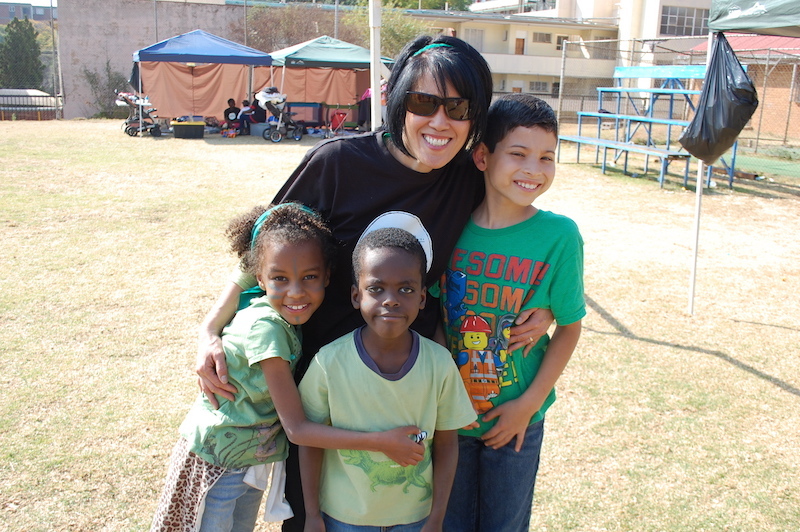 Andre is Director of Operations for 1Hope4Africa and Karlien serves as the ministry’s attorney. Truly a gracious gift to be living in gospel community with this precious family! We are also thankful that our side of the house is not sitting empty while we are away, but currently is being occupied by two 1Hope missionaries and a Living Hope Church family. We cannot express how thankful we are for this new home, it is our prayer that God would use it for His purposes to bring Him glory and further His kingdom. 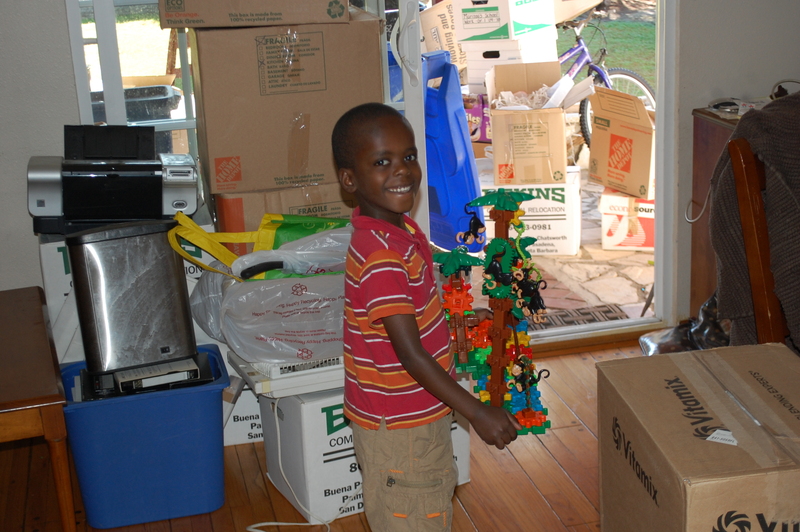 That we can get through all the details of packing up the shipping container with our belongings and donations. God has provided graciously for most of this shipping cost, but we still have a little more to go. Please pray for His sovereign provision in this. That we would make wonderful memories as we visit with friends and family while we are here. For all the other details that need to be taken care of during our visit. That others would partner with us through prayer and support. 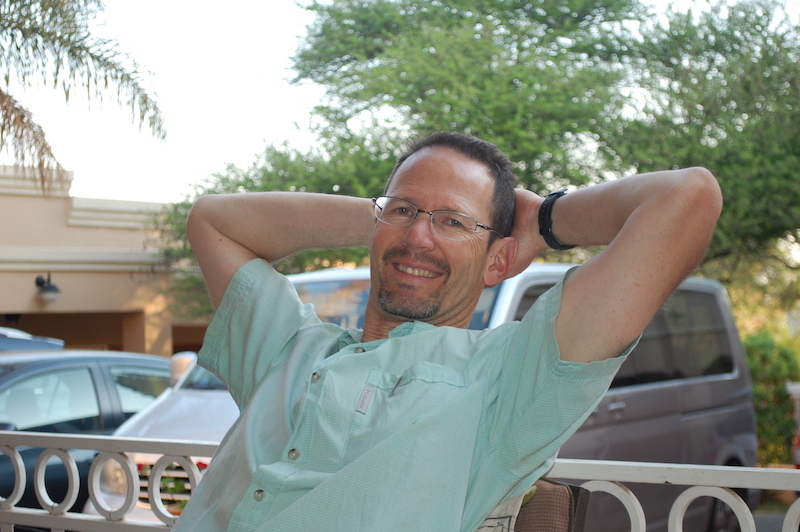 Jannie Combrink, November, 1948-Augus,t 2014 All of Living Hope Church will miss this dear brother, but rejoice that he has made it to his eternal home! On August 12, a faithful brother and member of Living Hope Church was called to his eternal home and is now sharing in his master’s happiness! Quiet, gentle 65 year-old Jannie was a man who though he had very little by the world’s standards, was rich in his love for the gospel. One of our favorite stories of Jannie is how he suffered a stroke one day, and was out the next day evangelizing in the park with a mission team. He grew weak and tired easily, so he sat on a park bench to watch and pray. Jannie had a tremendous impact on many lives as he humbly and lovingly served those whom God put in his path. Several young men stood up at the memorial service to testify how Jannie had ministered and discipled them. He was nothing less than a father to these men. One such young man is Ally whose life story shows our Lord as Rescuer and Redeemer from darkness and evil. Ally is from the Democratic Republic of the Congo (DRC) and at age 15 was forcibly taken from his family and home to be trained to serve with rebel armies in the jungle. He spent six terrible months in the jungle and then, through the help of his family, Ally was able to escape. For his safety, he fled his home country. After several months and making his way through Burundi, Tanzania, Malawi, Mozambique, and Zimbabwe, staying in refugee camps and taking odd jobs along the way, Ally finally found himself in Pretoria, South Africa and attending our very own Living Hope Church. 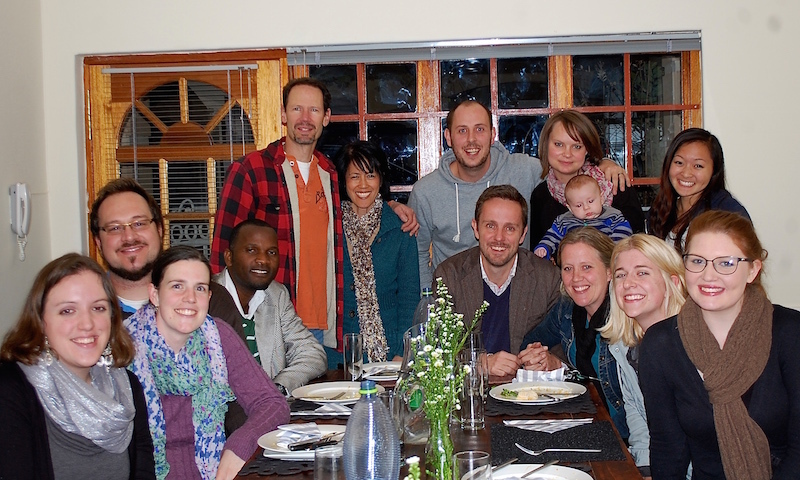 Back in RSA Our dear friends and fellow ministry partners, the Mack family and Andre DeWit returned safe and sound from their U.S. visit. 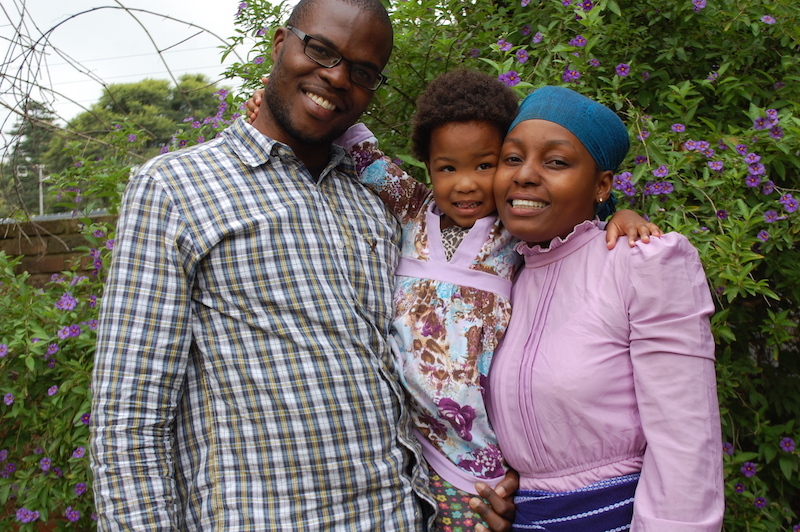 Mission Malawi Update– We are thankful and praise God that Newton, Vanessa and baby Aya have arrived in Linlongwe, Malawi and are beginning a new chapter of their long anticipated life and ministry! 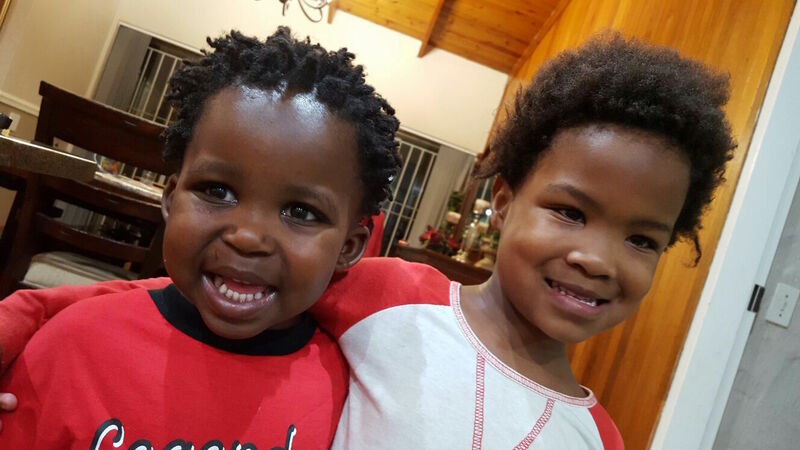 They will be there for five months and will then need to return to (hopefully, finally) complete the paperwork for their daughter’s adoption. 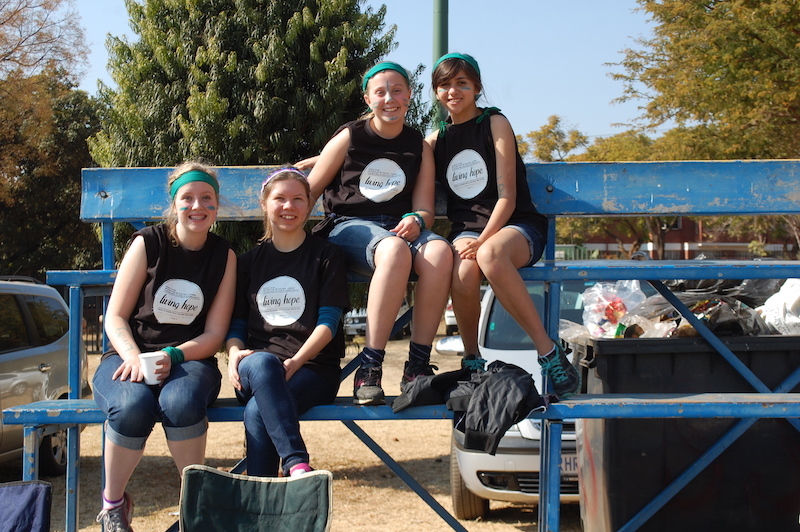 Swazi Connection Since our visit to Swaziland in June, God has provided us with the opportunity to build relationships with the founder and director of Hosea’s Heart, Mary-Kate Martin and her interns who are ministering in a home for sexually-abused girls in Swaziland. They have come to visit us for the weekend a couple of times and we have enjoyed hosting these special ladies as they take a needed retreat from their very demanding ministry. 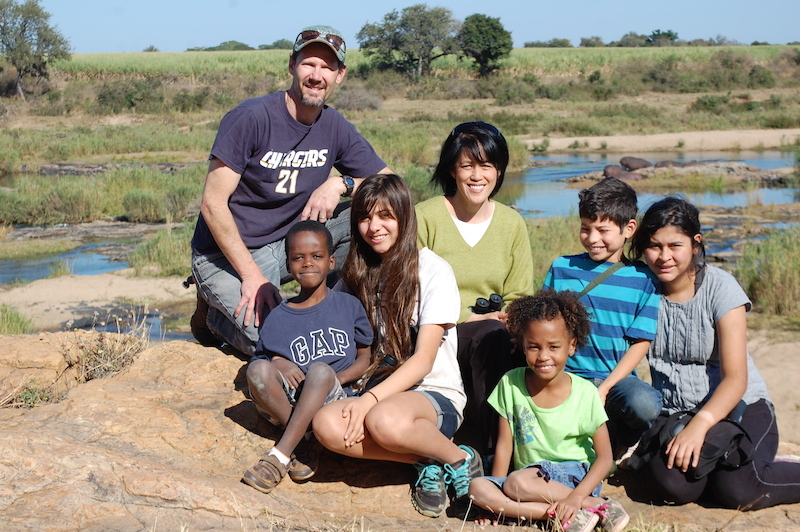 Clark Family News August marks the two-year mark for our family arriving in South Africa. When we first arrived in 2012, I truly believed that our time here was temporary; that we would return to resume our lives in Orange, California. But somehow, through God’s loving, gracious, gentle leading, we have come to realize that His will for our family is right here in South Africa. The reality of this has hit home last month as our house in Orange County, California went on the market, quickly sold and all our possessions were moved into storage! (Thank you so much, Grace Church of Orange and our dear friend and faithful realtor, Mark Donaldson!!) So strange that all this could happen to our “stuff” while we are on the other side of the world! As roots of our “old” life are being pulled up, we are laying down roots in another land. 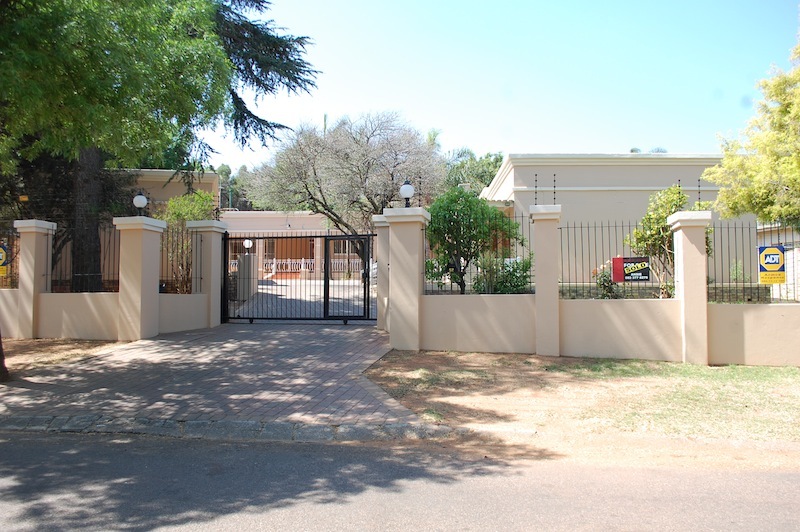 Through God’s generous provision, the sale of our house has allowed us to purchase one here in Pretoria, which we will be moving into at the end of this month! The house has so much opportunity for ministry/hospitality and we pray that God will use it for his kingdom purposes and that it would be a blessing for all who enter. For all the details that need to be seen to while in the U.S. – obtaining a new visa, going through all our possession that are in storage, securing a container to ship some of our things and donations for the ministry over etc..
A joy-filled holiday season with family and friends. We are so excited to see many of you!